Hutchison China MediTech (Chi-Med) has achieved the historic Chinese approval of fruquintinib, a first for a novel oncology drug discovered and developed solely in China. With this and its subsequent launch, the company accomplished a key goal, set at its foundation in 2000, of bringing the first of a wave of globally competitive products to market. Chi-Med is now firmly fixed on becoming a leading global biopharmaceutical company. It has a broad pipeline of first- or best-in-class clinical assets, in oncology and immunology, which together with well-established domestic sales forces, creates a powerful platform to market innovative products in China. Chi-Med is also taking first steps in building infrastructure to support commercialisation in the US and European markets. We value Chi-Med at £51.52/share or $33.49/ADS. Deep and diversified development pipeline Chi-Med has a strong clinical pipeline with eight best-/first-in-class tyrosine kinase inhibitors (TKIs) and is conducting numerous clinical trials globally. The lead programme, fruquintinib (Elunate), is partnered with Eli Lilly in China where it has been launched for colorectal cancer. There are currently three products in five registrational trials, and a further three such studies are due to start in the next six months. Notably, Chi-Med has a “big pharma” approach to clinical trials, focusing on maximising the value of each asset. Executing on globalisation of operations Savolitinib, a drug central to partner AstraZeneca’s life-cycle strategy for its non-small cell lung cancer (NSCLC) EGFR TKI franchise, is likely to be the first US product launch. Alongside this Chi-Med intends to use surufatinib, HMPL-523, HMPL-689, and fruquintinib to seed an international oncology franchise that will, over time, also market the other novel drugs generated by its proven discovery platform. 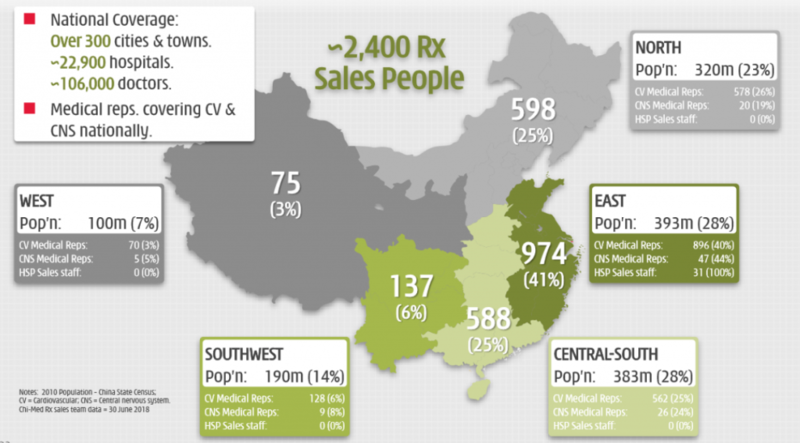 Well-established salesforces in China The two lead products, fruquintinib (Elunate, only in China) and savolitinib (worldwide), will be sold by Eli Lilly and AstraZeneca respectively. Chi-Med is expected to market all future products in China itself. At present its Commercial Platform has four divisions primarily selling western pharmaceutical and traditional Chinese medicine products, which generated FY17 sales of $677m. Historically, profits from the Commercial Platform provided funding for the drug development activities of the Innovation Platform; in the future, they will enable Chi-Med to realise the full value of its products in China. Our model indicates a valuation of £51.52/share or $33.49/ADS We value Chi-Med using a DCF-based sum-of-the-parts approach, including a detailed rNPV model of the clinical pipeline. Our current valuation is £3.4bn/$4.5bn equivalent to £51.52/share or $33.49/ADS. The depth of the development portfolio means a steady stream of share price catalysts are expected over the next 12-18 months. Hutchison China MediTech (‘Chi-Med’) is a China-based, globally focused, biopharmaceutical company, active in discovery, development, manufacturing, and commercialisation of biopharmaceuticals. The investment case rests largely on the success of its Innovation Platform (Hutchison MediPharma), which has multiple near-term clinical and regulatory catalysts for its oncology and immunology pipeline of novel highly selective small molecule tyrosine kinase inhibitors (TKIs). The prospects for the Commercial Platform (China Healthcare) remain compelling, as the Chinese healthcare market is still one of the fastest growing in the world. Continued success within the Innovation Platform has opened the opportunity for management to create a global direct marketing presence. This would see Chi-Med becoming a world-class biopharmaceutical innovator that, while continuing to be China-based, sells its products directly in China and major Western markets. We believe a sum-of-the-parts approach is the best way to value Chi-Med. The Innovation Platform is a classic drug discovery and development unit, and a DCF-based model is particularly suitable. We calculate a risk-adjusted net present value (rNPV) of the various clinical projects (adjusted for success probabilities), sum them, and net this against costs. We adopt conservative assumptions throughout. The Commercial Platform generates meaningful sales and profits, so earnings-based metrics are an appropriate valuation method. Our valuation is £3,428m ($4,456m), equivalent to £51.52/share or $33.49/ADS. (Each ADS = 0.5 shares). Chi-Med posted H118 revenues of $102.2m. The Commercial Platform’s consolidated sales were $88.6m (down 15% as the “two invoice” accounting/ booking system was implemented, although underlying product sales increased) and non-consolidated sales were $271.7m (a 21% rise). R&D spend in the Innovation Platform was $66.7m (up from $37.5m in H117), resulting in an increased overall net loss of $32.7m ($1.7m net income in H117). Cash resources were strong at $416.9m ($479.6m at Dec 2017), which coupled to unutilised bank facilities of $94.4m, is sufficient to fund the increased R&D spend and commercial infrastructure build out through to at least 2020. As a fully-integrated biopharmaceutical company, the typical industry risks (clinical, regulatory, funding, partnering, competition, commercialisation, and pricing) apply. However, TKI pipeline breadth and scope reduces technical risk, covering various mechanisms of action (including known MOAs) with potential across a range of cancer indications. In addition, investor concerns about China (economic, political, regulatory) are mitigated by strong domestic management, increasingly global operations, and a supportive shareholder in CK Hutchison. Its large holding (c 60%) does reduce the free float and constrain liquidity; however, Chi-Med has made significant corporate progress and is now included in the NASDAQ Biotech and MSCI China indices, contributing to improved liquidity (3-month average trading volume is 500k+). Key sensitivities are detailed later, but in summary we believe the issues are well known and containable, with a strong investment case more than offsetting any investor concerns. Hutchison China MediTech is a world-class innovator and developer of novel compounds. It has exploited the fertile research environment in China to create a broad portfolio of best-/first-in-class programmes that are progressing through late-clinical development. Approval and launch of its first product, fruquintinib, in China marks the culmination of the founding goals, and highlights the significant next stages of its strategy. Historically, the Commercial Platform was sometimes viewed as a source of funding for the Innovation Platform, but this is now set to be the cornerstone of the marketing infrastructure for the Innovation products in China. Importantly, Chi-Med will also seek to market selected products in the US and Europe itself. Commendably, Chi-Med has a “big pharma” approach to clinical trials, and soon marketing, as it focuses on maximising the value of each asset. Chi-Med was established in 2000 to exploit the huge opportunities that exist in healthcare in China. These are linked to the sustained strong double-digit growth in healthcare expenditure driven by the rapidly growing middle- and upper-classes and Government-led initiatives. The timing was ideal to exploit the then emergent scientific environment to create a world-class drug discovery company, with cost and time advantages over its US and European counterparts. The commercial opportunities in China are as large as ever, especially given the growing demand for better oncology products, as shown by the success of AstraZeneca’s Tagrisso (osimertinib). Chi-Med is well placed to benefit with the Innovation Platform’s broad and diversified pipeline. In 2018, Chi-Med received China regulatory approval for its first product, fruquintinib (Elunate) in colorectal cancer (CRC), which was launched by partner Lilly in November. Over the coming years Chi-Med is set to expand fruquintinib’s label into several further indications, and to launch two more drugs in multiple oncology settings. Key to realising the full value of its China oncology assets is the Commercial Platform. It currently has a c 2,400 strong salesforce in its subsidiaries and JVs, selling a variety of pharmaceutical products domestically. This infrastructure will be expanded to form a potent platform to market its own novel drugs in China. The first two products, fruquintinib and savolitinib, will be marketed by Eli Lilly (China-only, Chi-Med has co-promotion rights under certain circumstances) and AstraZeneca (global); however, we expect Chi-Med to retain China rights to future products. This should help it to secure its position as a leading biopharmaceutical company in China, the world’s second largest pharmaceutical market. However, Chi-Med’s ambitions are broader than its home market. The impressive success of its drug discovery programmes has generated a pipeline of highly selective tyrosine kinase inhibitors (TKIs), purposefully designed to be first-or best-in-class, with this potential confirmed by clinical data presented so far. This globally competitive profile opens the opportunity for Chi-Med outside of China (Global Innovation). It is now starting to execute plans to build a global (ex-China) oncology franchise around fruquintinib, surufatinib, HMPL-523, and HMPL-689. Chi-Med is entering an important period, with the prospect of several product launches in numerous indications over the coming years. Continued clinical success, coupled with clear commercial execution, should lay the foundations for Chi-Med becoming a truly global China-based biopharmaceutical company. Tracing Chi-Med’s history back to its creation in 2000 highlights the phenomenal journey that has been undertaken (Exhibit 1). Certainly, the opportunities identified at the time were compelling, but a cold examination of the goals and objectives set out then demonstrates that their magnitude and scale are materially larger and longer lasting than foreseen. The laudable aim of becoming a globally recognised and influential science-driven biopharmaceutical player, with a sizeable commercial footprint in China, has been largely achieved; but, whilst this should be celebrated, the appeal of the journey remains as relevant today as it was then. 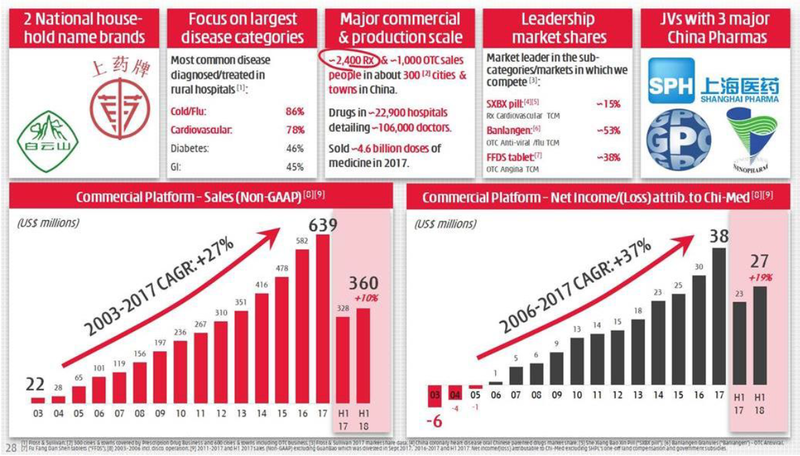 The prospects for healthcare-related companies operating in China are appealing at many levels, with numerous positives applying equally on the demand side as on the supply side. The demographics in China are well documented. An ageing population, more sedentary occupations as urbanisation continues, coupled with lifestyles rife with high risk factors (for instance, the incidence of smoking is still high), mean that conditions such as cardiovascular disease, diabetes, and cancer, are set to rise materially. Add in rising levels of education, an increasingly affluent middle class, supportive government policies (at both the national and regional levels), and the ingredients are in place for sustained market growth. Industry audits such as IQVIA (formerly Quintiles IMS) predict pharmaceutical value market growth of between 3% and 6% CAGR over the next five years, with the prescription market expected to rise from $137bn in 2018 to $140bn-$170bn by 2023. The prospects have attracted multi-national drug companies, with almost all global pharmaceutical companies either having established a direct presence or have created extensive joint ventures. The growth of chemically-based drug products (often known as Western drugs) in China is understandable, and partly reflects the changes in medical practice as the efficacy (and superiority) of such therapies, especially in the treatment of more debilitating conditions (notably cancer), is increasingly recognised. The morbidity and mortality burden of cancer is high in China. It has, since 2010, been the leading cause of death in the country, and in 2015, the estimated incidence was 4.3m cases, with more than 2.8m cancer-related deaths. A rapidly aging population suggests that incidence is likely to continue to increase. Compared with Western geographies, there are significant differences in epidemiology, with higher prevalence of stomach, liver, and oesophageal cancers, and a much higher incidence of lung cancer. Lung cancer is the most common cancer in China, due mainly to the number of active smokers (1/3 of those globally) and air pollution. China represents c 20% of the world’s population, but currently accounts for c30% of cancer patients globally. However, the high cost and low quality of available oncology drugs mean that China represents only 4% of the global oncology drug market, and oncology drugs only account for 9% of domestic drug sales. Hence there is strong rationale for the development and commercialisation of effective, high quality, and affordable therapies for the domestic market. It is against this background that Chi-Med’s Commercial Platform should become increasingly prominent in the medium-term. This has the potential to become a potent means for Chi-Med to commercialise not only its own existing products in China, but to market the emergent fruits of its China Oncology Innovation Platform clinical pipeline and so retain significantly more of the economics. Chi-Med’s novel, potentially best-/first-in-class, pipeline of highly selective small molecule tyrosine kinase inhibitors (TKIs) is now maturing. It comprises eight clinical stage products, three of which are currently in registration trials. In September 2018, the first unconditional approval in China of a novel oncology product (Elunate) that was both discovered and developed in China was achieved. This important milestone has focussed investor attention on the Innovation Platform and its potential for meaningful inflection points. A large element of this report details the progress underway at the Innovation Platform. We believe we are entering a particularly interesting period as numerous projects are at key points in the development process, where continuing success should result in material value creation. Expected news flow for 2019 is outlined in Exhibit 2 overleaf. Chi-Med is a dual-listed global biopharmaceutical company, founded in 2000 by Hutchison Whampoa (now a wholly-owned subsidiary of Hong Kong-listed multinational conglomerate, CK Hutchison Holdings). In May 2006, Chi-Med went public with a £40m (gross) AIM flotation, which was followed in March 2016 by a $110m ($96m net) NASDAQ IPO. A NASDAQ secondary offering raised $301m ($293m net) in October 2017. CK Hutchison remains a controlling shareholder with a c 60% stake. Chi-Med operates a hybrid business model with two divisions: its global Innovation Platform and China-focused Commercial Platform. The group’s organisational and ownership structure is outlined in Exhibit 3. Chi-Med has grown organically and built a fully integrated commercial business in China (Commercial Platform) through acquisition and joint ventures with established pharma and consumer health peers. With an eye on broader horizons, the company (via its Hutchison MediPharma, HMP, subsidiary) has also discovered and developed an innovative biopharmaceutical pipeline for the domestic and global oncology and immunology markets (Innovation Platform). This has been well-funded by IPO and follow-on proceeds, payments from partners and collaborators, and by the profitable and cash-generative Commercial Platform. The Chinese biopharmaceutical sector has grown rapidly, as favourable changes to regulatory policy in China, coupled with the easing of restrictions for listing on the Hong Kong stock exchange, have stimulated interest in the region. The former includes major reform measures such as stricter good laboratory practice/good clinical practice, and new schemes covering priority review and approval, IND filing, and a revised marketing approval holder (MAH) authorisation. The latter has created an alternative option to NASDAQ for Chinese biotechs and international firms seeking a foothold in China. Five companies (including Chi-Med’s partners, Innovent Biologics and Shanghai Junshi Biosciences) have listed, with a further 11 companies having announced IPO plans since Hong Kong listing rules changed in April 2018, permitting pre-revenue/pre-profitability companies to list provided certain rules are met, including a >HK$1.5bn market cap (c US$200m). Against this background of growing investor excitement and focus on Chinese biopharma, Chi-Med’s business model and global outlook sets it apart from its domestic peers. Its platforms provide important differentiation, demonstrating a track record of successful commercialisation coupled with an innovative high-quality pipeline of assets. These assets span the spectrum of development to commercialisation (Exhibit 4), and include various programmes nearing significant clinical inflection points and near-term targeted China NDA submissions. 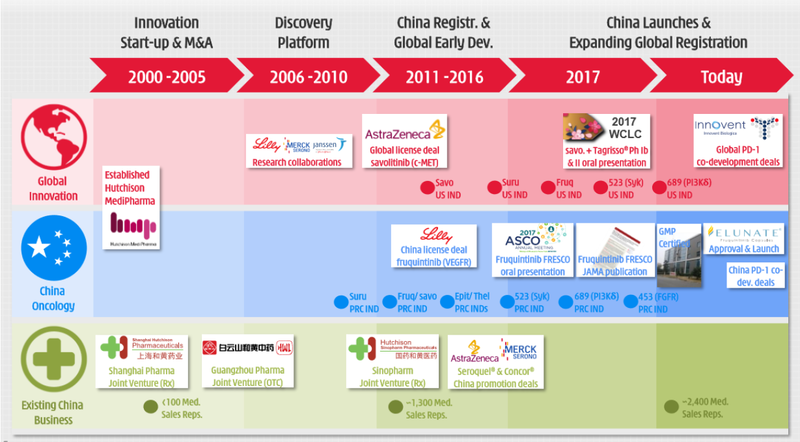 Chi-Med’s drug pipeline consists solely of internally discovered drug candidates that are being developed for the Chinese (‘China Oncology’) and global (‘Global Innovation’) markets. This contrasts with the more common model of many Chinese peers, whereby Chinese rights to late-stage or already approved drugs are in-licensed from US/European partners. Internal innovation may be a higher risk proposition vs a de-risked external asset, but it comes with potential higher reward, in terms of more attractive economics (higher value retention) and a more sustainable model. Chi-Med has demonstrated success in clinical development with eight clinical programmes in multiple studies, and a first approval by the Chinese National Medical Products Administration (NMPA, the new name for the China FDA) of fruquintinib in third-line (3L) metastatic colorectal cancer, represents the achievement of a major milestone. Additionally, Chi-Med’s pipeline has a clear focus on selective small molecule TKIs for the treatment of oncology and immunology diseases. It has a >400-strong scientific team and is emerging as a leading player in the TKI segment, rather than vying for position in more crowded highly competitive ‘hot’ areas such as immuno-oncology or biologics. Instead the company has developed a pipeline of either first- or best-in-class candidates, which have potential combination opportunities. Chi-Med has an extensive commercial presence in high margin prescription drugs and in consumer health (including traditional Chinese medicine, TCM) though various JVs and subsidiary undertakings. This integrated platform covers the value chain from manufacturing (with two major factories employing c 1,200 staff) through to pan-China marketing and distribution via c 2,400 medical reps. There is the potential for Chi-Med to market its own novel TKIs through its Hutchison Sinopharm subsidiary. Over 200 employees are employed within drug distribution operations and the new oncology business department within Chi-Med subsidiaries. The oncology commercial organisation currently numbers c 30 people, with the company targeting significant expansion to c 200 by end-2020. Few China biotechs have similar capabilities, which raises the question of how they intend to market their own products domestically. In contrast, Chi-Med is a fully-integrated company that will be able to manufacture and launch new products following their approval. Tyrosine kinase inhibitors (TKIs) are a diverse group of targeted small molecule cancer therapies that block the activity of a family of enzymes known as tyrosine kinases. Tyrosine kinases are involved in signal transduction cascades, acting as ‘on/off’ switches for many aspects of cell growth and in immune system regulation. The central role of tyrosine kinases in modulating growth factor signalling means that they are one of the most important target classes in cancer across the pharmaceutical industry. 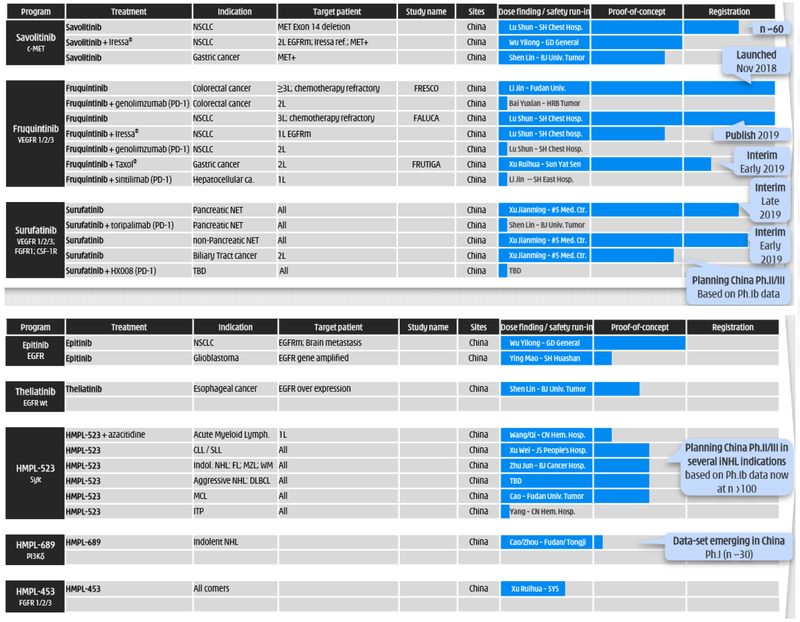 To date, the US FDA has approved nearly 50 drugs targeting protein kinases for use in cancer. Visiongain estimated 2014 global kinase inhibitor sales of c$18.5bn in oncology, with the expectation that this would at least double by 2025. A number of these transformative, and commercially lucrative, therapies are TKIs. In 1998, the first TKI was approved: Novartis’s Gleevec (imatinib) for chronic myeloid leukaemia (CML). Gleevec reached global sales of $4.7bn in 2015, the last year prior to patent expiry, although in 2018 sales were still $1.6bn. Other TKIs with, or approaching, blockbuster status include: Tarceva (erlotinib, Roche), Nexavar (sorafenib, Bayer), Sutent (sunitinib, Pfizer), Votrient (pazopanib, Novartis), and Tagrisso (osimertinib, AstraZeneca). The TKI field is undoubtedly competitive. However, the sheer diversity of the class (Exhibit 5) coupled with advances in the understanding of tumour biology, and continued growth in the global cancer market mean there are still significant opportunities for developing novel or next-generation TKI drugs. These may offer improved efficacy or safety, and be more amenable to combination strategies. Additionally, TKIs offer cost advantages, simpler manufacturing, and more patient-friendly administration (oral vs IV) over targeted biologic therapies. IQVIA estimates that global spend on cancer drugs will rise from $133bn in 2017 to $200bn by 2022. This growth is underpinned by demographic trends (ageing populations contributing to rising cancer incidence and prevalence) and increasing uptake of new types of therapy (particularly immunotherapies, with PD-1/PD-L1 now forming the backbone of combination approaches in many indications). Source: Trinity Delta; Hoijat-Farsangi, Int. Journal of Molecular Sci. (2014) 15(8). Note: TK: tyrosine kinase; EGFR: epidermal growth factor receptor; VEGFR: vascular endothelial growth factor receptor; FGFR: fibroblast growth factor receptor; HER2: human epidermal growth factor receptor; HGFR/MET: hepatocyte growth factor receptor; PDGFR: platelet-derived growth factor receptor; ALK: anaplastic lymphoma kinase; BCR-ABL: breakpoint cluster-Abelson oncogene; JAK: Janus kinase; and SYK: spleen tyrosine kinase. combination strategies: treatment paradigms involve multiple lines of therapy to overcome acquired resistance and increasingly, combinations that couple chemotherapy with targeted drugs. Safety/tolerability profile is often the limiting factor that restricts potential combinations, due to potential for additive toxicity or drug-drug interactions. Chi-Med’s differentiated pipeline of highly selective TKIs puts it in a strong competitive position in China and globally. The company has considerable experience in applying fragment-based design to engineer potent small molecules with optimised binding to on-target proteins and enhanced selectivity. Dose modifications or discontinuations are less common than with multi-kinase TKIs, and this improved tolerability makes them more suited to combination with various anticancer drugs (chemotherapy, other TKIs, mAbs, or immunotherapies). Chi-Med is applying this experience in developing both first-in-class molecules addressing novel kinase targets, and best-in-class drugs directed at previously validated targets. Advances in the understanding of tumour molecular genetics and emergence of acquired drug resistance has created opportunities for targeted therapies, while combination approaches and multiple lines of therapy are common in cancer. Therefore Chi-Med’s holistic development approach involves an extensive clinical programme covering a spectrum of settings (1st/2nd/3rd line; monotherapy/ combination therapy) in multiple tumour types to diversify clinical risk and identify the most appropriate patient population(s) for each programme. The relative lack of innovation in marketed cancer therapies in China vs the rest of the world (discussed later) provides an opportunity for Chi-Med’s programmes to be developed as monotherapies for China. However, globally, the strategy is development as part of a combination to improve survival outcomes and maximise pipeline value. The selectivity of Chi-Med’s TKIs lends them to a combination approach, with combinations of two Chi-Med TKIs or a combination with PD-1/PD-L1 checkpoint inhibitor immunotherapies having the potential to be highly efficacious and lucrative for the company. The commercially important immuno-oncology field is being explored through multiple collaborations (Exhibit 6). 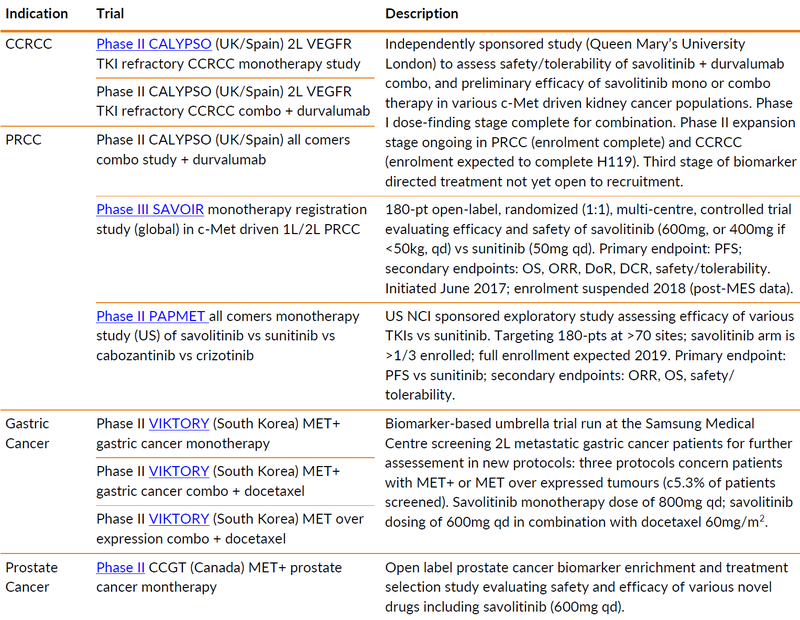 Studies are underway combining c-Met inhibitor savolitinib with PD-L1 checkpoint inhibitor durvalumab (Imfinzi, AstraZeneca), and four new collaborations have been secured to evaluate various combinations of Chi-Med’s VEGFR inhibitors, surufatinib and fruquintinib, with PD-1 monoclonal antibodies in different solid tumour indications. Source: Trinity Delta, Hutchison China MediTech. Notes: ccRCC = clear cell renal cell carcinoma; PRCC = papillary renal cell carcinoma; HCC = hepatic cell carcinoma; pNET = pancreatic neuroendocrine tumours; mCRC = metastatic colorectal cancer; NSCLC = non-small cell lung cancer; BTC = biliary tract carcinoma. Commercially, China is an important market for Chi-Med’s emerging oncology franchise. Since 2016, China has been the second largest global pharmaceuticals market behind the US. An aging population coupled with lifestyle factors (eg smoking) and improvements in diagnosis mean cancer incidence continues to rise. The market opportunity in oncology is attractive, particularly given the limited availability and low penetration of Western developed drugs. However, for Chi-Med to maximise the returns from its late-stage pipeline, its R&D and commercialisation strategy is multi-faceted. It involves development and strategic execution in a broad range of relevant indications (and within them, treatment settings) in both China and internationally, as well as the retention of development and commercialisation rights to key assets (eg surufatinib). Government commitment to improving patient access and health in China has been manifest in recent policy changes, including expansion of state medical insurance schemes, updates to the National Drug Reimbursement List (NDRL), and regulatory changes facilitating accelerated approval. These initiatives should have a significant impact in improving the accessibility and affordability of innovative therapies. A 2017 analysis indicated that only 4 of the 42 cancer drugs approved globally between 2011-15 were available in China. However, in the July 2017 NDRL update 15 new oncology drugs were added (at an average c 50% discount to the US list price), with a further 17 added in October 2018. Against this backdrop of change in China, Chi-Med is well-positioned, with an innovative pipeline of China-developed TKI drugs. Following NMPA approval and launch, the company’s ability to leverage its domestic market knowledge and commercial infrastructure should help drive market penetration of its TKI drugs. Chi-Med’s large pharma deals have played a vital role in the internationalisation of its outlook. Non-dilutive funding and external validation are two benefits of the co-development and licensing deals with Eli Lilly (fruquintinib China rights) and more significantly AstraZeneca (global savolitinib). Less obviously, these partnerships have also supported the development of in-house expertise in manufacturing (fill/finish), development, and regulatory affairs, which Chi-Med has used in connection with its first US clinical trials (fruquintinib Phase I US; surufatinib pNET/BTC Phase I/II). These capabilities will be essential in progressing the Global Innovation pipeline. One or other of these drug programmes will likely blaze a trail for Chi-Med’s global commercial strategy and complete its transition from a China-focused company to an international oncology player. The intention is for these to be followed by a second wave of wholly-owned products. To prepare for this transition, Chi-Med has expanded its international operations, opening a US office in New Jersey, and appointing two key senior managers: a US Chief Medical Officer, and a Head of International Operations. Chi-Med expects to expand its global operations to c 30 staff by end-2019. Over the medium-term, the number of global development programmes in ex-Asia trials (including pivotal studies) is expected to grow; the physical presence in the US will facilitate interactions with the FDA, Principal Investigators, and commercial stakeholders. The Innovation Platform (Hutchison MediPharma) underpins the near and mid-term investment case. Its pipeline of highly selective small molecule TKIs – designed to be potentially best-/first-in-class – is approaching several important clinical and regulatory catalysts. The pipeline consists solely of internally developed assets, generated by a 400-person scientific team using a chemistry-focused approach that has resulted in improved target selectivity, and reduced known class-related toxicities. The pipeline includes eight clinical stage drug candidates that are being evaluated in over 30 studies worldwide (in China, as well as Australia, Europe, North America and South Korea); five of these are Phase III or registration trials, with another three on track to initiate by mid-2019. Chi-Med’s plans for its Innovation Platform for the next 24 months are detailed in Exhibit 7. The breadth and depth of the TKI pipeline is illustrated overleaf: Exhibit 8 shows the status of the five Global Innovation assets, while Exhibit 9 presents the eight China Oncology assets in development. China Oncology is the more mature franchise with a first product launched, and four registration studies ongoing. However, Global Innovation is on the cusp of transitioning from dose escalation studies to multiple proof of concept studies, and as a result we expect a growing proportion of R&D spend to be directed towards US/EU trials. Savolitinib and fruquintinib are both subject to partnering deals with AstraZeneca and Eli Lilly respectively (summarised in Exhibit 10); these provide validation for Chi-Med’s TKI pipeline, as well as contributing external expertise and funding. Deal economics have made a significant positive impact on the finances through upfront/milestone payments and equity injections (aggregate receipts totalled $135.5m as end-FY17), and by funding a large proportion of clinical trial costs. Both deals have subsequently been renegotiated, with Chi-Med contributing more to development funding in exchange for improved down-stream economics from a potentially greater opportunity. For example, the recent amendment to the Eli Lilly fruquintinib deal was the result of a lengthy negotiation to obtain freedom to operate on life cycle management. Chi-Med is now able to invest in exploring and exploiting the compound’s unique selectivity in further indications in China. Assuming continued successful development, regulatory approval, and future commercial success for these programmes, Chi-Med should receive additional milestone payments and tiered royalties on net sales. A $13.6m milestone was received from Eli Lilly on the fruquintinib China NDA approval in 3L mCRC. A potential milestone is associated with the fruquintinib Phase III gastric cancer trial interim analysis in mid-2019; however, according to management, there is a high bar to achievement. Our base case assumption is that the FRUTIGA trial will proceed following the independent safety monitoring board analysis, but no milestone will be paid. The next AstraZeneca milestone is likely on the start of enrolment into the global pivotal Phase II/III NSCLC trials in H119. Clearly, the China NDA approval (September 2018) and launch (November 2018) of Elunate (fruquintinib) in 3L mCRC marks a watershed for both Chi-Med and the domestic pharmaceutical industry. It was the first approval and launch of a Chinese discovered and developed drug in China. However, this approval is the first of multiple oncology indications for fruquintinib in China, opening the door to a $500m-1bn sales opportunity, from which Chi-Med will receive 15-29% royalties. Fruquintinib had also progressed into pivotal China Phase III trials in two other indications: 3L NSCLC (FALUCA) and 2L gastric cancer (FRUTIGA). However, top-line FALUCA data released in November 2018 indicated that the primary endpoint of a statistically significant difference in overall survival vs placebo had been missed, but all secondary endpoints did achieve statistical significance. Full data is expected to be presented at a forthcoming conference. The second indication, 2L gastric cancer, is the most lucrative for the China market given the limited treatment options and high incidence. FRUTIGA (gastric cancer in combination with paclitaxel) is currently enrolling and is on track for an interim analysis in mid-2019, with top-line Phase III results expected in 2020. We expect fruquintinib life cycle indications (LCIs), beyond the initial three indications mentioned above, to be announced in due course. We also highlight the potential development and commercial opportunities from fruquintinib combinations (including with PD-1 checkpoint inhibitors). We would expect subsequent China approval decisions for fruquintinib to be more rapid given that CMC (chemistry, manufacturing, controls) clearance has already been granted as part of the first approval process for mCRC. In addition, the plan remains to expand the fruquintinib opportunity geographically, with a Phase I bridging study ongoing to take it into the US. More details are provided later in the note. Savolitinib (HMPL-504/AZD6094/volitinib) is a novel highly selective potentially first-in-class inhibitor of the c-Met receptor tyrosine kinase (RTK). It has been studied in over 700 patients to date and is at the centre of an extensive clinical programme run in conjunction with AstraZeneca. This encompasses fourteen late-stage Phase II and III trials in six different cancer indications, covering both monotherapy and combinations in a variety of different lines of therapy, patient populations, and geographies. Over the next 24 months, savolitinib is expected to generate significant news flow, unlocking near-term pipeline value. The c-Met (mesenchymal epithelial transition factor) RTK, also known as HGFR (hepatocyte growth factor receptor), is involved in cell survival, cell proliferation, motility, migration, and invasion. It functions abnormally in many types of solid tumours and is more commonly seen in metastases rather than primary tumours, highlighting its role in the progression of tumourigenesis. Mutations in c-Met are associated with poor prognosis. Overexpression is linked to metastatic disease and acquired resistance to EGFR TKIs; hence, there is solid scientific rationale for targeting c-Met and EGFR inhibition in combination to overcome this. Savolitinib is an important strategic asset for both Chi-Med and AstraZeneca; the latter initially licensed global co-development/commercialisation rights in 2011. The terms of the agreement were subsequently amended in 2016, increasing Chi-Med’s share of savolitinib’s longer-term economic value (via higher global ex-China royalties) in exchange for an additional near-term investment towards PRCC (papillary renal cell carcinoma) development costs. Savolitinib is being studied in multiple indications, as monotherapy and in combination with chemotherapy (gastric cancer) and targeted AstraZeneca drugs (NSCLC: TKIs gefitinib and osimertinib; renal cell cancer: PD-L1 durvalumab). The major commercial opportunity for savolitinib globally is non-small cell lung cancer (NSCLC), which forms the strategic cornerstone of the collaboration. Global NSCLC development is focused on combination studies; multiple proof of concept Phase II trials are underway, including with AstraZeneca’s third-generation EGFR TKI Tagrisso (osimertinib). 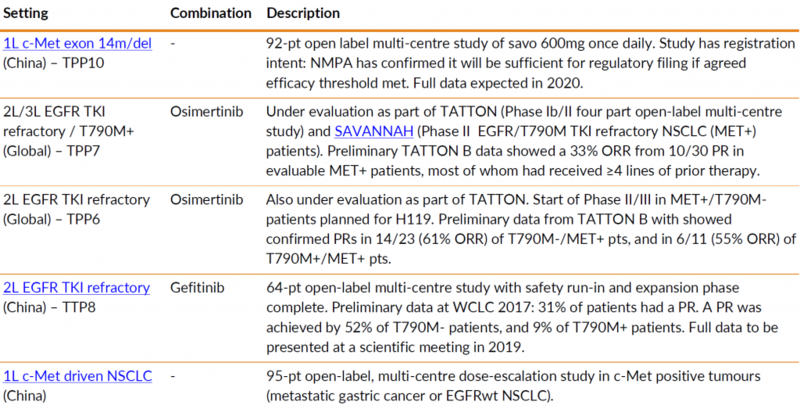 SAVANNAH, a recently initiated global Phase II study evaluating savolitinib + osimertinib in c-Met+ 2L EGFR/T790M refractory NSCLC, should read out in 2021 and could enable US approval. Chi-Med/AstraZeneca anticipate announcing plans for further potentially pivotal combination trials in 2019, following data review from the TATTON (savolitinib + osimertinib) and gefitinib + savolitinib studies. 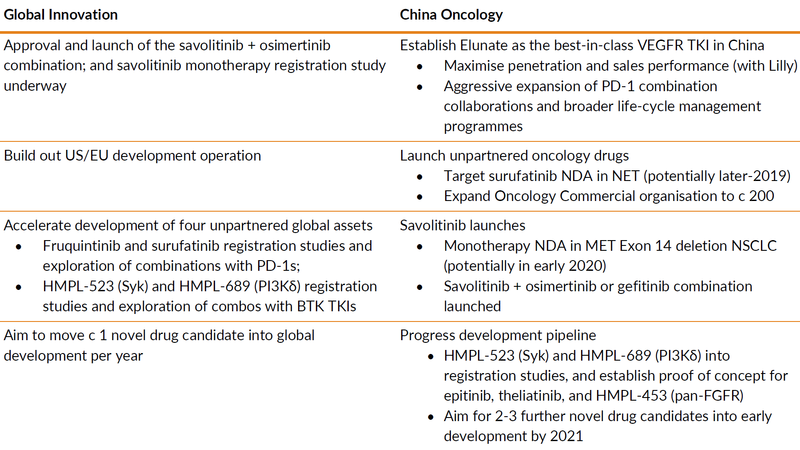 NSCLC also presents the potential for accelerated approval in China for savolitinib monotherapy in its most advanced indication: MET exon 14 mutated/deleted NSCLC. Subject to positive China Phase II data, an NDA could be filed in 2020. AstraZeneca has two EGFR TKIs approved in NSCLC: Iressa (gefitinib: 2017 sales of $528m) and Tagrisso (osimertinib: 2017 sales of $955m). We highlight that full FDA and EMA approval of osimertinib was granted in early 2017, and it has already surpassed blockbuster status, with strong 9M18 sales of $1.266bn (+91% at CER). Osimertinib was approved in China in March 2017 and was added to the China NDRL as a second line treatment for NSCLC patients in October 2018. Savolitinib is an important facet of AstraZeneca’s efforts in life-cycle management and boosting the commercial potential of its EGFR TKI franchise. Both drugs are associated with development of acquired resistance; a combination EGFR + c-Met TKI approach including savolitinib could be a mechanism to circumvent this. A successful savolitinib + osimertinib development programme could result in this combination becoming a new standard of care in NSCLC (depending on patient population and therapy line). Exhibit 11 illustrates the settings that may merit further clinical evaluation. Globally, NSCLC is the most common cancer, representing c 85% of the 2.1m new cases of lung cancer annually (WHO, Globocan 2018). 5-year survival rates are 18.6% for cancer diagnosed at any stage (SEER), and between 1-30% for late-stage disease. Over half (57%) of all patients are diagnosed with poor prognosis metastatic disease, which has 5-year survival of <5%. China represents a high proportion of this incidence: c 733k cases (Chen et al. Cancer Statistics in China, 2015) due to high smoking prevalence, with US incidence of c 234k (SEER). Market size, continued unmet need, and advances in the understanding and treatment of molecularly defined subgroups has led to rising R&D investment in NSCLC. Several novel therapies have recently entered the market (including immunotherapies, most notably Merck’s Keytruda, pembrolizumab), with others expected to do so in the coming years. Consequently, Transparency Market Research projects the NSCLC therapeutics market to be valued at $15.1bn by 2023, up from $6.2bn in 2016 (Grand View Research). Chemotherapy (platinum-based and/or taxane) has historically been the default option for 1L advanced NSCLC, although targeted therapies are used 1L where there are identifiable driver mutations (eg EGFR, ALK, ROS-1, BRAF) or 2L following progression on chemotherapy. In tumours with high PD-L1 expression (>50%), immunotherapy (pembrolizumab) has become 1L standard of care. EGFR (epidermal growth factor receptor) mutations are relatively frequent in NSCLC, with a c 15% prevalence in the US and Europe, and a higher rate of 40-60% in Asian populations. The most common EGFR activating mutations are exon 19 deletions or exon 21 (L858R) substitutions. Approved first-generation EGFR TKIs, Tarceva (erlotinib, Roche) and gefitinib, the second-generation Gilotrif/Giotrif (afatinib, Boehringer Ingelheim), and third-generation osimertinib are all are indicated for use in 1L mNSCLC with identifiable EGFR exon 19 or exon 21 mutations, as detected by an FDA approved test. In China, Conmana (icotinib, Betta Pharma) is also approved in 2L NSCLC, and has captured over a third of the market share. Acquired resistance to EGFR TKIs has emerged, mainly through two distinct resistance mechanisms: T790M mutation (T790M+) in the EGFR gene (c 50% of cases) and c-Met amplification (c 20% of osimertinib-resistant patients). Osimertinib was designed to provide a treatment option for EGFR T790M+ patients who have progressed after EGFR TKI therapy. It is approved in >75 countries for use as a 2L therapy in EGFR T790M+ NSCLC and is a new standard of care for 1L EGFR exon 19 or exon 21 mutated NSCLC (in 40 countries). Targeting inhibition of both EGFRm and c-Met pathways could be an effective mechanism to overcome EGFR TKI resistance, and provide another treatment option for 2L relapsed/refractory NSCLC. We note that the US National Comprehensive Cancer Network (NCCN) treatment guidelines recommend testing for c-Met amplification after progressing following 1L EGFR TKI therapy, and that increased 1L use of osimertinib will likely increase the addressable pool of c-Met+ patients. Data presented at ESMO 2018 highlighted c-Met amplification as one of the most frequent acquired resistance mechanisms to osimertinib, being detected in 15-19% of patient plasma samples in Phase III FLAURA and AURA3 trials (Exhibit 12). We highlight that frequency of MET amplification post-osimertinib therapy using tissue biopsy (standard clinical practice) is typically higher: for example, Piotrowska et al. found it occurred with 30% frequency. Osimertinib has median PFS of 10 months for 2L mNSCLC (post 1L EGFR therapy), thus there is rationale for evaluating whether a savolitinib + osimertinib (or gefitinib) combination in the 2L and 3L settings (Exhibit 13) could further improve survival. Potential for BTD (Breakthrough Therapy Designation) also means this setting could be attractive and have a rapid path to market. 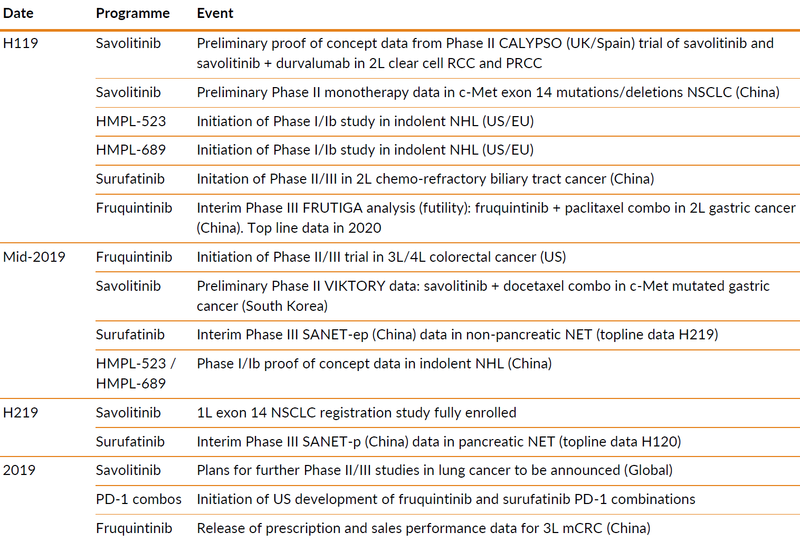 AstraZeneca and Chi-Med are currently running various proof-of-concept trials of savolitinib in NSCLC (Exhibit 14). Planning for initiation of global pivotal Phase III combination studies with osimertinib is well advanced. AstraZeneca has prioritised the development of this combination due to the promising data generated to date (Exhibit 15, presented at WCLC 2017), and FDA and EMA approval of osimertinib for 1L EGFRm NSCLC in 2018 (on the basis of the Phase III FLAURA trial which showed statistically significant 8.7 month improvement in median PFS vs gefitinib and erlotinib). Initiation of the Phase II SAVANNAH trial is the first step towards embarking on a global registration study for a savolitinib combination. 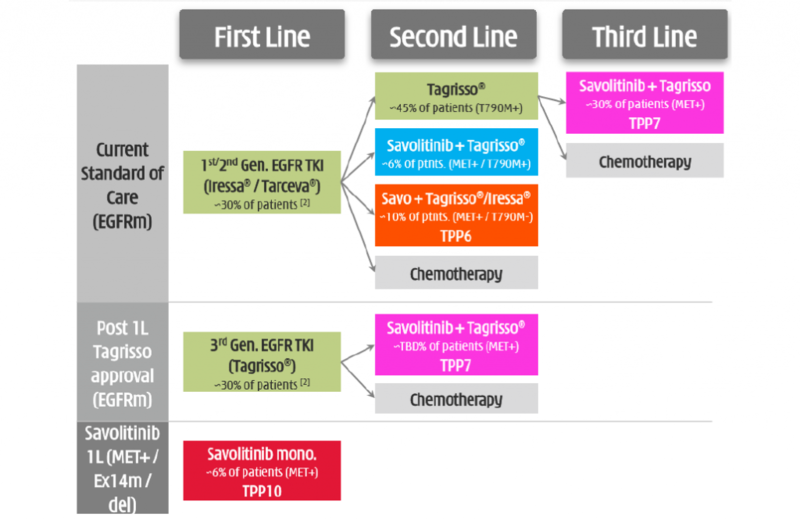 SAVANNAH is a 170-pt single-arm global Phase II trial of savolitinib (600mg, 300mg if <55kg qd) and osimertinib 80mg qd in patients with c-Met+ EGFRm NSCLC (TPP7). It aims to enrol ≥50% of 2L patients that have progressed following osimertinib and should deliver top line data in 2021. Crucially SAVANNAH is being closely aligned with the AstraZeneca’s ORCHARD Phase II platform trial, which is an open label multi-centre Phase II study examining multiple treatment options for 2L EGFRm NSCLC following progression on osimertinib. ORCHARD will involve molecular profiling and the intention is to prioritise patients identified with c-Met+ EGFRm NSCLC (which meet the relevant inclusion criteria) for enrolment in SAVANNAH. This strategy will not only facilitate recruitment, but an enriched patient population should boost the chance of success for the trial. If outcomes from SAVANNAH are comparable with the high response rates seen in early TATTON data (WCLC 2017), Chi-Med and AstraZeneca could explore accelerated approval pathways with the FDA. The TATTON trial began enrolling in August 2014 and is a four-part multi-centre study assessing the safety, tolerability, pharmacokinetics, and preliminary anti-tumour activity of osimertinib combinations with savolitinib or selumetinib in 2L EGFRm+ advanced NSCLC. It is structured as follows: combination dose finding (part A), dose expansion (parts B and D) and Japan dose finding sub-study (part C). TATTON A established a dose of 600mg savolitinib qd + 80mg osimertinib qd. However, preliminary data from 66-pts in TATTON B indicated 30% discontinued savolitinib due to adverse events, suggesting that the optimal dose may be lower. Consequently, TATTON D is evaluating a meaningfully lower savolitinib dose of 300mg qd + 80mg osimertinib qd, and AstraZeneca plans to study a weight-based dosing algorithm instead of a flat dose in future trials. For reference, TATTON C is studying a flat 400mg savolitinib dose + osimertinib in Japanese patients only. Pivotal trial design and dosing for other global savolitinib + osimertinib combination studies is subject to the outcome of regulatory discussions and data from the dose expansion parts of the Phase Ib/II TATTON study (initiated in June 2016). Mature TATTON B (including PFS) and preliminary TATTON D data will be of particular relevance. AstraZeneca and Chi-Med have indicated that TATTON data continue to mature and are consistent with that reported at WCLC 2017. Presentation of the complete TATTON dataset is planned for a scientific conference during 2019. 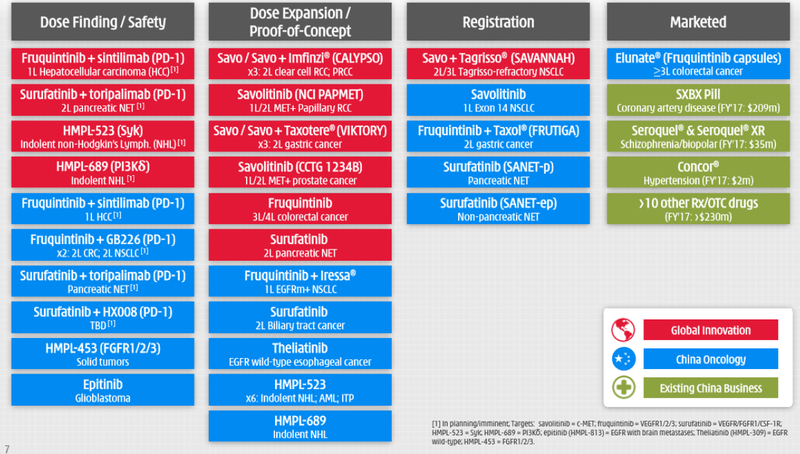 In addition to SAVANNAH, AstraZeneca and Chi-Med are planning a global study in 2L EGFR TKI refractory c-Met+/T790M- NSCLC (TPP6) which is slated to start in H119 and will run in parallel, rendering data in 2021. This strategy of running two global trials in parallel in two NSCLC target patient populations (TPP6 and TPP7) should give the combination the best chance of reaching the market rapidly, especially as both have BTD potential. A subgroup approach is being pursued to support first approval in China, in 1L NSCLC with c-Met exon 14 mutations/deletions (MET ex14m/del). Such genetic alterations in c-Met ex14 occur in c 3% of NSCLCs, inhibiting degradation of the c-Met receptor, and resulting in a persistent oncogenic effect. Following discussions with the NMPA, if complete data from the ongoing 92-pt single arm Phase II study (due in 2020) meets an agreed efficacy threshold, an NDA could be submitted on this data alone. Enrolment for this study is expected to complete in mid-H219, with potential for preliminary data to be published at a major conference in 2019. Other China trials include a monotherapy study in 1L c-Met driven NSCLC and a Phase I evaluating the combination of savolitinib + gefitinib in 2L EGFRm MET+ T790M- NSCLC (TPP8). Results from the latter are anticipated at a 2019 scientific meeting. Following encouraging data at WCLC 2017, further development of savolitinib + gefitinib was under discussion; however, this is a lower priority to the savolitinib + osimertinib combination, and is not a certainty as, in our view, it may become less relevant given the evolution in clinical practice for NSCLC. Savolitinib is also being studied in other c-Met driven cancers (Exhibit 16), most notably renal cell carcinoma (RCC) and gastric cancer. RCC, or more specifically c-Met-driven papillary renal cell carcinoma (PRCC) was formerly savolitinib’s first indication for the global market; but due to changing competitive dynamics, this has now been overtaken by MET ex14m/del 1L NSCLC. The multi-kinase VEGFR TKI sunitinib (Sutent, Pfizer), approved in 1L CCRCC (clear cell renal cell carcinoma: c 80% of all RCC) is emerging as a highly effective treatment for 1L PRCC irrespective of c-Met status. In addition, there is considerable industry enthusiasm for VEGFR TKI/PD-1 combinations in RCC, such as axitinib/avelumab and lenvatinib/pembrolizumab which have been granted FDA BTD. The PD-1 nivolumab (Opdivo, BMS) is also approved for 2L CCRCC. MES was a pooled global analysis of historical PRCC patient samples (pre-2016) intended to determine whether c-Met driven disease is predictive of worse PFS/OS outcome, supporting accelerated approval. These samples pre-dated sunitinib CCRCC approval, and preliminary MES results also indicated lower incidence of c-Met+ disease than in previously published scientific literature and the US Phase II savolitinib PRCC study. Enrolment was consequently suspended in the SAVOIR registration study due to a low likelihood of success in 1L c-Met+ PRCC, and the impracticalities of rebalancing the ratio of 1L to 2L and above patients in the trial (as permitted by protocol following MES read-out), given lower than expected c-Met+ incidence and minimal use of sunitinib post-1L would suggest slow and lengthy recruitment. The focus in RCC now shifts to CALYPSO, an independently sponsored all comers Phase II study, which should render preliminary data in H119. CALYPSO is a three-part study evaluating savolitinib monotherapy and in combination with durvalumab (AstraZeneca’s PD-L1 Imfinzi) in RCC irrespective of c-Met status or PD-L1 expression. Durvalumab is already approved for NSCLC (FDA/EMA) and bladder cancer (FDA). The first stage (combination dose finding) is complete, and the second stage is currently recruiting: the first cohort consists of c 156 CCRCC patients randomised to one of four treatment arms (one being savolitinib monotherapy and a second savolitinib + durvalumab), while the second cohort will evaluate the savolitinib + durvalumab combination in PRCC (n=39). Numerous data read-outs for savolitinib over the course of 2019 should provide greater clarity on global development timelines and positioning in its two major indications. 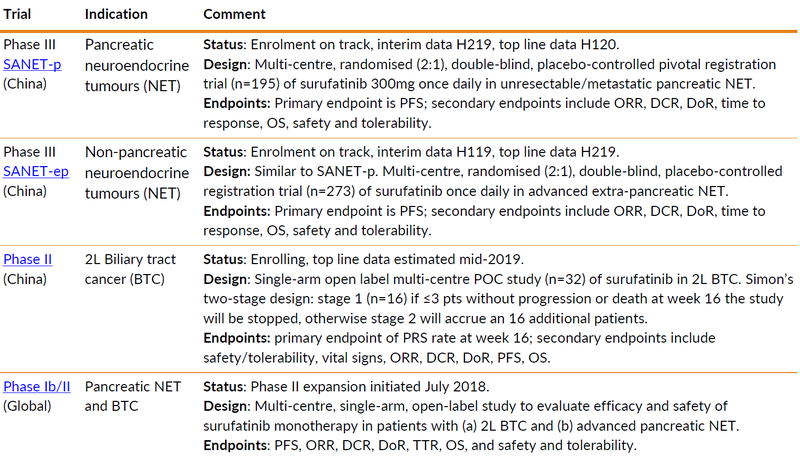 Complete TATTON data will inform the design and dosing of savolitinib + osimertinib registration trials in 2L EGFRm NSCLC, while preliminary CALYPSO results in H119 will contribute to defining the strategy in RCC. Alongside this, there is the prospect of first approval in China for 1L MET ex14m/del NSCLC in 2021. Fruquintinib is highly selective and potent small molecule pan-VEGFR (vascular endothelial growth factor receptor) inhibitor with best-in-class potential. As discussed earlier, it was approved in China as a monotherapy for third-line colorectal cancer (3L mCRC) and launched by partner Eli Lilly (which licensed China rights in 2013) as Elunate. This is the first of Chi-Med’s internally developed TKIs to be approved and commercialised in China. China NDA filing in June 2017 was supported by data from the 416-pt Phase III FRESCO trial in 3L CRC. This trial met the OS primary endpoint with median OS of 9.3 month in the fruquintinib arm vs 6.6 months for placebo (HR of 0.65, p<0.001). Median PFS was also significantly increased (3.7 months vs 1.8 months; HR of 0.26, p<0.01), with a clean safety profile. Full FRESCO data were published in the Journal of the American Medical Association in June 2018 (Li et al, JAMA 2018), the first time it had featured a China oncology trial in a full paper. 3L mCRC is the first of multiple indications in which approval for fruquintinib will be sought in China. NSCLC was previously intended to be the second of these, but it is now gastric cancer that takes its place with a China registration trial for 2L gastric cancer (FRUTIGA) currently ongoing. An interim analysis of the first 100 patients in the FRUTIGA study is expected in H119. Further detail on this study, and a China Phase II 1L NSCLC combination study with gefitinib, is shown in Exhibit 17. The fruquintinib strategy in NSCLC is likely to shift to an immuno-oncology combination approach following the disappointing FALUCA trial results coupled with the fast-evolving competitive landscape in NSCLC, and launches of several novel agents. FALUCA was a 527-pt Phase III in 3L NSCLC evaluating fruquintinib plus best supportive care. Top line data released in November 2018 indicated that the primary endpoint of a statistically significant difference in overall survival vs placebo had not been met. However, a statistically significant improvement was seen in all secondary endpoints (progression-free survival, objective response rate, disease control rate, and duration of response) vs placebo, and the safety profile was consistent with earlier studies due to the high selectivity against VEGFR 1/2/3. Detailed results are expected at an upcoming scientific meeting. Future development of fruquintinib in NSCLC will likely be as part of combination approaches. This concept is supported by the recent change to the Eli Lilly license and collaboration agreement, which provides Chi-Med with freedom to operate on life cycle indication (LCI) development (as monotherapy and in combinations). The China collaboration with Genor Biopharma for its PD-1 genolizumab (GB226) is a first step on this path. There are also potential proprietary TKI combinations that may merit exploration, such as fruquintinib plus epitinib in EGFRm+ NSCLC. Elunate is currently Chi-Med’s most valuable China asset. The December 2018 amendment to the Eli Lilly deal (summarized in Exhibit 18) is strategically important, providing Chi-Med with more control over development plans, increasing the potential market opportunity for the drug, and meaningfully improving its share of downstream deal economics. Source: Hutchison China MediTech Note: 1 = Per LCI in China, up to 3 LCIs; 2 = Based on total Elunate sales in China, triggered by first LCI launch. This amendment enables Chi-Med to exploit the LCI opportunity for fruquintinib as it now has development rights beyond the original three indications under evaluation (CRC, NSCLC, gastric cancer). Chi-Med will determine the pace and direction of LCI development, and while it will assume all LCI development costs, there is financial upside from higher milestones and royalties from a larger commercial opportunity. This improved future revenue stream will support other strategic initiatives such as progressing the Global Innovation pipeline. Chi-Med’s participation in the promotion of Elunate in China should also reap financial rewards and leverage its commercial acumen and nascent oncology commercial organization. Subject to the occurrence of certain commercial milestones, Chi-Med has secured co-promotion rights in provinces representing 30% of China sales, with the potential to increase this to 40% subject to meeting certain targets. Elunate sales will continue to be booked by Eli Lilly, with Chi-Med entitled to a fee for service on its promotional activities, and a 15-29% sales royalty. Both parties also benefit from a ‘Commercially Reasonable Efforts’ clause introducing an obligation to maximize sales and profit. Chi-Med now has freedom to operate with respect to exploring opportunities to fully exploit fruquintinib’s potential as a best-in-class VEGFR both in China and globally. In the first instance, Chi-Med and Eli Lilly are pursing approval for 2L gastric cancer in China; however, there are various other solid tumours that are currently not treated with an appropriate VEGFR inhibitor in China. The approval process and launch in the second (and subsequent) indications should be more rapid than for 3L mCRC given that CMC is complete, and Chi-Med has an established a GMP certified manufacturing facility in Suzhou, China. This facility produced clinical material for the Phase III studies and is manufacturing fruquintinib for commercial supply. The selectivity of fruquintinib also lends it to combination with other anti-cancer agents, an approach already being studied in the Phase III FRUTIGA trial (combination with paclitaxel) and the Phase II 1L NSCLC study (combination with gefitinib). A combination approach applied to global development plans would provide a competitive edge for fruquintinib (explored in more detail below). An 18-pt Phase I US study in solid tumours is underway, with completion expected imminently; a positive outcome should mean that global Phase III trials could be initiated relatively quickly. Proof of concept studies are expected to begin in 2019; a US registration study in regorafenib (Stivarga)/TAS-102 (Lonsurf) refractory/intolerant 3L/4L mCRC patients is in planning. There is significant potential for value capture through combination with checkpoint inhibitors, or novel proprietary combinations such as fruquintinib plus savolitinib for clear cell renal carcinoma (CCRCC). Grant of US FDA BTD for three VEGFR TKI + PD-1 combinations (lenvatinib + pembrolizumab; and axitinib + pembrolizumab or avelumab), which are in US Phase III registration trials for 1L CCRCC, validates the rationale behind such a combination. Chi-Med is in the early stages of evaluating the combinability of the first fruquintinib + checkpoint inhibitor combinations in dose finding/safety studies having recently entered into two PD-1 monoclonal antibody collaborations. In December 2018, a global partnership with Innovent Biologics with respect to sintilimab (IBI308), and a China collaboration with Genor Biopharma for genolimzumab (GB226), were announced. We note that indication selection for a potential PD-1 or PD-L1/fruquintinib combination would be determined by the different competitive dynamics in the China and ex-China markets. For example, in China an opportunity to move into RCC or HCC remains, whereas in the US and Europe gastric and colorectal cancers would be a more level playing field competitively. VEGF and its receptor VEGFR play a central role in angiogenesis (blood vessel formation), with VEGF overexpression promoting tumour growth, survival and metastasis. Consequently, it is a key target for anti-cancer therapies, with the anti-VEGF/VEGFR market currently valued at c $18bn. Of this, the humanized anti-VEGF-A mAb Avastin (bevacizumab, Roche/Genentech) represents the lion’s share (2018 sales: CHF6.85bn), despite its limited efficacy (particularly with respect to survival benefit), serious (albeit infrequent) side effects, and high price, as well as the more recent market entry of biosimilar Myvasi. VEGF-A (targeted by bevacizumab) is widely expressed by cancer cells and regulates angiogenesis and vascular permeability through the activation of the VEGFR-1 and VEGFR-2 receptors. Other VEGF isoforms (VEGF-C and VEGF-D) activate VEGFR-3 which regulates lymph vessel development. Fruquintinib inhibits all three VEGFR isoforms and has much lower affinity for other tyrosine kinases. Many approved VEGFR TKIs are non-specific multi-kinase inhibitors, which due to the breadth of their targeting leads to higher incidence of serious adverse events. The most relevant VEGFR TKI comparator for fruquintinib is Stivarga (regorafenib, Bayer), which has FDA, EMA, and NMPA approval in mCRC, GIST, and HCC. Regorafenib additionally targets RAFs, PDGFRs, c-kit and FGFR, and has a black box warning for liver toxicity; a cause for concern as 65-75% of Chinese 3L CRC patients also have liver metastases. Common side effects associated with VEGFR inhibition include hypertension, proteinuria, wound healing complications, hand-foot skin reaction, and vascular complications. Fruquintinib’s potency means it has better target coverage fully inhibiting VEGFR, and its selectivity profile ensures that off-target toxicities are reduced. It also has low risk of drug-drug interactions given a lack of CYP450 inhibition. This profile provides meaningful differentiation over other small molecule VEGFR inhibitors that are either already marketed or in development. It also provides rationale for use in combinations with chemotherapy, targeted therapies (including TKIs), and immunotherapies. Combination therapy has the potential to improve efficacy, and depending on the combination, could support expanded use of fruquintinib in earlier lines of therapy, driving its uptake and market potential. Fruquintinib-based combination therapy could address these two clear unmet needs. In the monotherapy setting, fruquintinib has already shown superior efficacy to its main VEGFR TKI competition, regorafenib. Comparing Phase III monotherapy data – albeit not from head-to-head studies and therefore with the usual caveats surrounding comparing data from two separate trials – of fruquintinib and regorafenib vs placebo is indicative of the former’s superior efficacy. Disease control rate, mPFS and mOS were all higher in the FRESCO trial 3L CRC compared with data from Chinese patients evaluated in the regorafenib’s CORRECT Phase III (and in the underpowered CONCUR study). In China, there are two other competing small molecule VEGFR inhibitors. Multi-kinase inhibitor Focus V (anlotinib, Sino Biopharm) received NMPA approval for 3L NSCLC in May 2018, while VEGFR1/2 inhibitor Atan (apatinib, Hengrui) is approved in gastric cancer and under evaluation in a Phase II/III NSCLC study. Despite the difficulty of comparing across different trial designs and patient populations, there are indications that fruquintinib’s efficacy is at least comparable if not better, and it has a more tolerable side effect profile. Further efficacy benefit could be achieved through fruquintinib combinations; combination with targeted therapies or checkpoint inhibitors has shown efficacy in preclinical tumour models. Improved therapeutic outcome could be achieved through this approach due to the combination of potentially synergistic mechanisms of action, ie simultaneously inhibiting tumour angiogenesis and tumour cell signalling or immune evasion. Bevacizumab is approved in several cancer indications as a combination therapy with chemotherapy or targeted agents, including in NSCLC (where it is standard of care) and mCRC, both indications which fruquintinib is pursuing. However, bevacizumab is associated with increased treatment-related SAEs and mortality, and while infrequent, the most common potentially fatal side effects are haemorrhage, neutropaenia, and gastrointestinal tract perforation. Fruquintinib’s daily oral dosing schedule (vs IV administration of bevacizumab every 2 or 3 weeks) provides more flexibility and can be used to manage toxicities seen with other therapies, particularly biologics. This flexibility, particularly when coupled with potential combination with other TKIs, could allow for improved efficacy (longer PFS and OS) and improved tolerability, resulting in lower drug-related treatment discontinuations. In an across trial comparison of early data (in 26 patients) from the Phase II 1L NSCLC fruquintinib plus gefitinib combination study with results from the Japan Phase II Avastin plus erlotinib combination trial, fruquintinib compares favourably. It showed a lower discontinuation rate than bevacizumab + erlotinib in Phase II (4% vs 41%) as well as lower frequency of hypertensive SAEs (4% vs 60%). Two other anti-VEGF biologics are marketed in the 2L setting in the US and Europe. These are Sanofi/Regeneron’s recombinant VEGFR fusion protein Zaltrap (aflibercept, mCRC), which has completed an Asian Phase III in 2L mCRC (AFLAME) and Eli Lilly’s recombinant human IgG1 anti-VEGF-2 mAb Cyramza (ramucirumab, gastric cancer, NSCLC, and mCRC), which is enrolling in a China Phase III 2L gastric cancer trial and four additional global Phase IIIs. In November 2018, Elunate was launched in China by Eli Lilly as an out-of-pocket drug, priced at RMB 21,960 per 4-week cycle (equivalent to US$3,300). Its positioning is not based primarily on pricing as ensuring patient access is a priority for driving penetration into the 3L mCRC setting. Chi-Med assessments put annual China incidence of 3L mCRC at c 57,000 treated patients (c 15% of the 380k annual incidence of mCRC), with potential China peak sales of Elunate in this indication of $110-160m (assuming 20-25% penetration). This equates to c $20-35m in net income, based on 15-20% tiered royalties. We model Elunate (China 3L mCRC) peak sales of $122m. A domestic Patient Access Programme (PAP) has been established to ensure broad availability while reimbursement discussions are ongoing. The PAP is subject to qualification criteria, but essentially limits the cost of treatment to a maximum of three cycles (cycle 1, 2, and 5) with all other treatment cycles provided free of charge. Clinical data indicates average usage before disease progression will be five months (5.5 cycles), with mPFS of 3.7 months. Reimbursement discussions are underway, and there is strong potential for Elunate’s future inclusion on the National Drug Reimbursement List (NDRL) given the listing of domestically developed drugs such as apatinib (in gastric cancer) and anlotinib (in NSCLC). NDRL inclusion is typically associated with large price discounts (c 50% on average US list price for drugs listed in 2017). However, for novel drugs (such as trastuzumab and bevacizumab), a Chi-Med analysis based on data from the R&D-based Pharmaceutical Association Committee (RDPAC) and McKinsey sales data showed that NDRL inclusion facilitates around a four-fold increase in patient penetration, driving sales volumes. Initial data on Elunate uptake and prescribing levels may be provided at Chi-Med’s FY18 results in March, but as this will only cover the first few weeks of launch, we expect more meaningful data on patient penetration at H119 results in July. Surufatinib (formerly sulfatinib) is a novel selective oral small molecule TKI which targets three RTKs involved in tumour angiogenesis and immune evasion: VEGFR, FGFR (fibroblast growth factor receptor) and CSF-1R (Colony stimulating factor-1 receptor). Its mechanism of action involves: (1) inhibition of angiogenesis and tumour growth and (2) activation of T-cells through VEGFR/FGFR, coupled with (3) prevention of production of tumour-associated macrophages (white blood cells), which play a role in tumour cell immune evasion, via CSF-1R inhibition. Surufatinib’s angio-immuno kinase profile differentiates it from other VEGFR TKIs. It also supports development in various cancers as both a multi-functional single agent, and further evaluation of potential combinations with checkpoint inhibitors. Surufatinib’s ability to inhibit production of tumour associated macrophages (TAM) facilitates generation of a PD-1 induced immune response. This feature will be explored as part of Chi-Med’s recently announced PD-1 monoclonal antibody collaborations, which include a global deal with Shanghai Junshi for toripalimab, and a China-only partnership with Taizhou Hanzhong for HX008. Surufatinib is Chi-Med’s most advanced wholly owned asset. It is targeting an NDA for neuroendocrine tumours in late-2019, positioning it for a potential China launch in late-2020/2021. Management has a three-pronged strategy for development in China and the US, initially as a monotherapy in six target populations with high unmet need and limited treatment options. Exhibit 19 summarises ongoing trials. The priority for surufatinib is securing a rapid first approval in China in all types of neuroendocrine tumours (NET). NET is an umbrella term for tumours that develop from cells in the endocrine and nervous systems, most commonly in the digestive and respiratory tracts. Two pivotal Phase III trials are in progress: SANETp (pancreatic NET) and SANET-ep (non-(extra)-pancreatic NET). Top line data from both is expected in 2019/20, with China NMPA filing shortly after (contingent on positive data) and a potential launch in China in late-2020/2021. Global development is also underway. Following a positive result in the US Phase I solid tumours dose-escalation study, confirming a 300mg once daily dose (same as in China), a Phase Ib/II initiated in July 2018. This trial is focused on pancreatic NET and biliary tract cancer (BTC, or cholangiocarcinoma). BTCs are a group of rare malignancies arising from the biliary tract epithelia, and this is also the most advanced of the indications under investigation in exploratory Phase II proof of concept studies in China. A China Phase II study in second-line BTC is enrolling, with plans for the initiation of a larger Phase II/III China registration study in the same indication in H119 (targeting read out in 2021). Two Phase II POC trials in thyroid cancer (advanced medullary thyroid cancer, and iodine-refractory differentiated thyroid cancer) are fully enrolled. Surufatinib development is focused on indications where there is high unmet need and potential for a rapid path to market given the relative rarity of the cancer types targeted and limited treatment options. We explore the two indications in which Chi-Med is pursuing (or planning) pivotal Phase IIIs in more detail below. Casting the NET wide: a broad spectrum option? Neuroendocrine tumours (NETs) are a rare group of cancers, albeit with rising incidence and prevalence as diagnostic techniques improve. Epidemiological data are unclear given the heterogeneity of NETs: however, US figures (SEER) suggest incidence of c 20k, with c 140k prevalence. There are no broad spectrum therapies, instead NETs can be split into two distinct populations (pNET and epNET) on the basis of molecular genetics and treatment options. epNET is typically treated with somatostain analogues (lancreotide, octreotide) which inihibit release of various hormones. 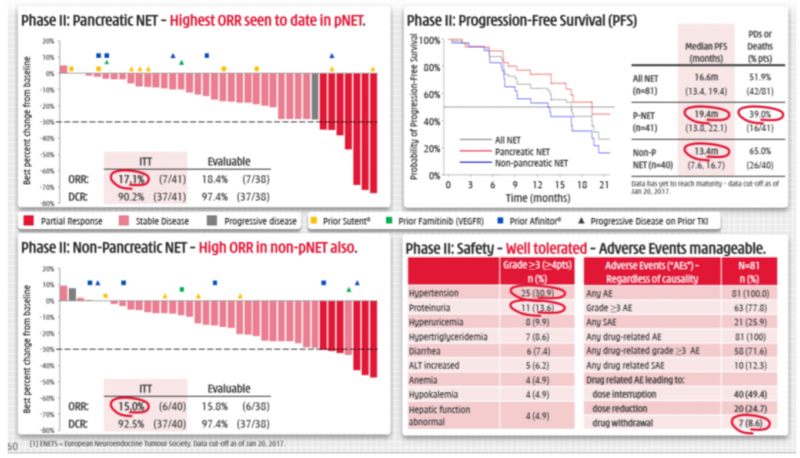 The global standard of care for advanced (unresectable or metastatic) pNET is targeted therapy: approved drugs include Sutent (sunitinib, Pfizer), a multi-kinase TKI (targeting VEGFR, PDGR, c-kit, Flt3, Ret), and mTOR inhibitor Afinitor (everolimus, Novartis). Sunitinib approval provides validation for targeting VEGF pathways in pNET, and surufatinib data to date supports the rationale for development in both NET populations. Early data from the Phase II China NET trial (Exhibit 20) suggests that surufatinib has a favourable efficacy profile vs sunitinib, and everolimus, as well as demonstrating anti-tumour activity in all patients including those who had failed on prior therapy. Surufatinib’s ORR (overall response rate, tumour shrinkage of >30%) of 17% is the highest reported to date in pNET, and a mPFS of 19.4 months was reported. In comparison, the ORR for both sunitinib and everolimus was <10% in their respective registration trials in advanced pNET, with a near doubling of PFS (10.2 months with sunitinib, and 11.4 months on everolimus) vs 5.4 months on placebo. Like NETs, biliary tract cancer (BTC) is are a heterogeneous group of cancers with limited treatment options and a growing patient population. Globally, it is the second most common liver cancer behind HCC, although incidence varies geographically (0.5-2 cases per 100k in US/Europe; 7.5/100k in mainland China) driven by key risk factors. BTC development has been linked to liver fluke infection (more common in Asia), chronic biliary and liver diseases (hepatitis B and C, cirrhosis, primary sclerosing cholangitis), and lifestyle factors that contribute to chronic liver inflammation. There are difficultes in diagnosing BTC so it typically presents late, with high mortality rates for patients with unresectable or metastatic disease. First-line treatment is platinum-based chemotherapy in combination with gemcitabine or gemcitabine monotherapy; however, there is no established 2L therapy following progression. Failure to demonstrate a benefit of two TKIs (AstraZeneca’s cediranib and Bayer’s sorafenib [Nexavar]) in combination with chemotherapy in prospective Phase II trials, leaves an opportunity for targeted therapy. 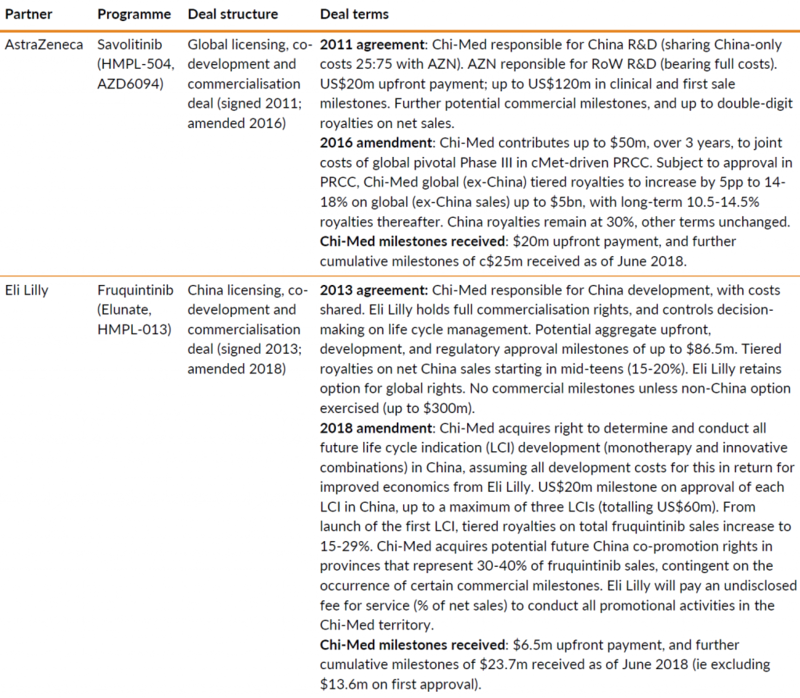 Chi-Med clearly view this as an attractive opportunity given plans are underway to initiate a pivotal Phase II/III in 2L chemo-refractory BTC in China in H119. High incidence rates in Asia, coupled with the prospect of marketing this wholly owned asset themselves, back the value proposition for surufatinib in BTC. Longer-term growth potential will be bolstered by further product opportunities emanating from Chi-Med’s early-stage pipeline of five wholly-owned clinical drug programmes (China Oncology). Two of these assets (HMPL-523 and HMPL-689) also feature on the Global Innovation pipeline. Results from ongoing or planned studies should provide proof of concept within the next 12-18 months. Chi-Med also continues to remain focused on innovation at the discovery phase of development. The company is creating a broad, differentiated and high-quality range of assets against multiple novel targets (Exhibit 21), to form the basis of future oncology combination regimens. The intention is to progress 2-3 of these into early clinical development during 2019-21. This pipeline depth points to the strength of Chi-Med’s discovery platform and its ability to generate differentiated drug candidates. Epitinib is a potent and highly selective EGFR inhibitor that has been designed to optimise penetration across the blood-brain barrier (BBB), resulting in higher drug concentration in the brain. Use of EGFR inhibitors (both mAbs and TKIs) has transformed the treatment of EGFR mutated (EGFRm+) cancers, significantly improving overall survival; however, a notable limitation is their inability to cross the BBB (mAbs) or in effective concentrations (gefitinib and erlotinib). In preclinical studies, epitinib demonstrated efficacy, and improved BBB penetration to erlotinib. Clinical data has also been promising, with preliminary results from the Phase Ib study in 1L EGFRm+ NSCLC presented in a poster at WCLC 2016. This data indicated that epitinib was safe and well tolerated, with encouraging efficacy: ORR (lung and brain) was 62% in TKI-naïve patients, and 70% in c-MET negative patients with measurable brain metastases. The trial was subsequently expanded and confirmed 120mg once daily as the recommended Phase III dose. During 2018, Chi-Med began enrolment into a China Phase Ib/II proof of concept trial of epitinib monotherapy in glioblastoma with EGFR amplification. Glioblastoma is an aggressive primary brain cancer with poor prognosis due to limited treatment options; median survival is c 15 months, with a 5.5% five-year survival rate. Standard of care is surgery, followed by radiotherapy and chemotherapy. However, with high recurrence rates and high incidence of EGFR amplification and mutation (c 40-60%), if efficacy is proven in the clinic, a BBB-penetrant TKI such an epitinib could be a game-changing glioblastoma therapy. Theliatinib is a highly selective, potent oral EGFR inhibitor, engineered to have significantly greater binding affinity to wild-type EGFR (wtEGFR) proteins, and thus potentially has greater efficacy than currently available EGFR TKIs (gefitinib and erlotinib) in treating solid tumours without activating EGFR mutations. In wtEGFR preclinical models, theliatinib has shown superior anti-tumour activity, with 5-10x the potency of erlotinib. Tumour types with a high incidence of wtEGFR activation (gene amplification and protein over-expression) include oesophageal cancers, glioblastoma, NSCLC and head and neck cancers. The first indication management is pursuing for theliatinib is oesophageal cancer (30-90% of tumours exhibit wtEGFR over-expression), an area of major unmet need in China due to high incidence and mortality. Oesophageal cancer is the 8th most common cancer globally but ranks third in China, with between 220k (WHO IARC) and c 480k (Chen et al, 2015) new cases annually vs c 17k in the US. A lack of effective treatment options for contributes to a poor prognosis (5-year survival rates of 5-10%) and TKI competition is limited, although Gilotrif (afatinib, Boerhinger Ingelheim) and Conmana (icotinib, Betta Pharmaceuticals) are in exploratory Asian Phase II trials. Enrolment has completed in the theliatinib all-comers solid tumour Phase I study, with the expansion stage of a China Phase Ib in 1L oesophageal cancers ongoing. HMPL-523 is a potential best-in-class oral Syk-inhibitor. Syk (spleen tyrosine kinase) is a non-receptor kinase which plays a key role in B-cell signalling. Phase I/Ib proof-of-concept trials in haematological cancers are ongoing in Australia and China: Phase I ‘3+3’ dose escalation (n=60) is complete with the recommended Phase II dose identified, and Phase Ib dose expansion enrolling (n=40 AUS; n=152 CHN). A 40-pt China Phase I open-label study in combination with azacitidine in previously untreated elderly patients with AML (acute myeloid leukaemia) recently initiated. This latter study will also have dose-escalation and dose expansion components. A US IND application for HMPL-523 was cleared by the FDA at the end of June 2018, and Chi-Med is now planning for Phase II/III development. HMPL-523 was designed to have high tissue distribution and selectivity to avoid severe off-target toxicities (ie diarrhoea, hypertension) seen with first-generation Syk-inhibitors, and to have a more favourable profile to second-generation programmes such as entospletinib (Gilead). The first Syk-inhibitor, a first generation product, Rigel’s Tavalisse (fostamatinib), was FDA approved in April 2018 for adult chronic immune cytopaenia (ITP). However, in 2013, it was discontinued in rheumatoid arthritis (RA) due to a non-competitive efficacy/side effect profile vs on market anti-TNF therapies, and AstraZeneca returned rights to Rigel, which is pursuing development in niche autoimmune indications. Syk is a clinically validated targeted in RA and there is significant potential for HMPL-523 in inflammation. It has shown superior selectivity for Syk compared with fostamatinib (and importantly, lower affinity for KDR which is linked to hypertension) and strong efficacy in preclinical RA models. However, the near-term focus for HMP-523 development is in B-cell malignancy indications, which require smaller clinical programmes. In China this will include multiple non-Hodgkin’s lymphomas (NHL), that may have fast track designation potential. Global development will centre on indolent NHL. BTK TKI refractory NHL is a major unmet medical need. HMPL-523 and Chi-Med’s PI3Kδ inhibitor HMPL-689 (profiled below) have potential to overcome acquired resistance (most commonly through mutations in C481S or PLCγ) as part of a combination approach with BTK inhibitor Imbruvica (ibrutinib, Janssen). Other development-stage single kinase Syk-inhibitors include two at Gilead: entospletinib (Phase II in haematological malignancies) and GS-9876 (Phase II in Sjogren’s syndrome and lupus). Two multi-kinase programmes are also under evaluation for haematological cancers: cerdulatinib (Portola, Phase IIa, dual Syk/Jak); TAK-659 (Takeda, Phase I, dual Syk/Flt3). HMPL-689: PI3K of the bunch? HMPL-689 is a novel oral PI3Kδ inhibitor, designed to be best-in-class (first-in-class in China) due to improved isoform selectivity, potency, and pharmacokinetic activity. These characteristics are key to global plans to develop HMPL-689 as part of novel combinations, with potential to tackle treatment resistant tumours. PI3Kδ is one of four different isoforms of PI3K (phosphoinositide-3-kinase) an enzyme associated with allergy, inflammation, and cancer. Activating mutations are commonly found in solid tumours, with the PI3K pathway also implicated in development of drug resistance. Each isoform is differentially expressed in various tissues (which in part defines their toxicity profiles), with PI3Kδ preferentially expressed on leukocytes, and playing a role in Treg function and peripheral T-helper cell differentiation. FDA and EMA approvals of Zydelig (idelalisib, Gilead) in 2014 validated PI3Kδ inhibition as a target for B-cell malignancies, and provided evidence that inhibiting PI3Kδ is effective in ibrutinib resistant populations. However, idelalisib is associated with liver toxicity, and most PI3Kδ inhibitors in development across a broad range of indications are multi-kinases (except Amgen’s Phase I AMG-319) which have shown frequent and severe adverse events. HMPL-689 is engineered to have lower toxicity through improved potency (>5x more potent than idelalisib) and improved isoform selectivity (reducing the risk of severe infection seen with Verastem/Infinity’s PI3Kγ/δ duvelisib and Bayer’s PI3Kα/δ copanlisib [Aliqopa]). HMPL-689 has completed an Australian Phase I dose-escalation in haematological cancers, which according to management generated highly encouraging albeit early data; Phase II preparations are underway. In China, an 83-pt Phase II in 2L/3L lymphoma is enrolling: data are anticipated in 2020. HMPL-453 is a potentially first-in-class pan-FGFR (fibroblast growth factor receptor) inhibitor targeting FGFR1/2/3. FGFR kinases are involved in activating an array of downstream signalling cascades associated with tumorigenesis and drug resistance. Genetic alterations in FGFR are oncogenic drivers, and while diverse (including gene amplification, mutation, or translocation) they occur at low frequencies in multiple tumour types. HMPL-453 was being evaluated in two Phase I dose-escalation trials in Australia and China, in an all-comers solid tumour population. The Australia study has been discontinued due to severe FGFR-related toxicities that have not materialised in the China trial, despite the latter evaluating higher doses. Low incidence of FGFR alterations across a range of cancers means that patient selection is important. There is also the prospect of boosting efficacy by improving potency and coupling this with combination therapy, and by improving selectivity to overcome common FGFR-related AEs such as hyperphosphatemia. Clinical data will determine whether HMPL-453 is well-positioned in these respects. Other FGFR inhibitors in development include multi-kinase TKIs which have a non-selective inhibitory effect that is often secondary to their dominant RTK targets, eg Iclusig (ponatinib) and Vargatef (nindetanib). Selective FGFR inhibitors in late-stage development include AZD4547 (AstraZeneca, Phase II combination trials in breast, lung and gastric cancers); BGJ398 (infigratinib, BridgeBioPharma/ Novartis, Phase II bladder and biliary tract cancer, with meaningful interim data shown in the latter), and JNJ42756493 (erdafitinib, Janssen/Astex, Phase III for urothelial cancer with FDA BTD). The roots of the Commercial Platform lie in traditional Chinese medicine (TCM) with the formation of two joint-ventures with existing strong domestic players. Shanghai Hutchison Pharmaceuticals (SHPL) is a 50:50 JV with Shanghai Pharmaceutical Holdings that specialises mainly in prescription TCM products that are distributed under the “Shang Yao” brand; and Hutchison Baiyunshan (HBYS) is a 50:50 JV with Guangzhou Baiyunshan, which has a range of well-known OTC products (eg Ban Lan Gen granules for colds, fevers, and respiratory tract infections, and Fu Fan Dan Shen tablets for chest congestion and angina). Both partners are listed on the Shanghai and Hong Kong stock exchanges. In 2014, a 51:49 JV with Sinopharm (listed on the Hong Kong exchange), known as Hutchison Sinopharm, was created to market third-party prescription products. Since 2015 this GSP-certified operation has exclusively promoted AstraZeneca’s Seroquel (quetiapine) and Merck Serono’s Concor (bisoprolol). This is accounted for on a fee-for-service basis, in line with the “two-invoice” regulatory system introduced in 2017. The prescription businesses, SHPL and Hutchison Sinopharm, contribute 72% (2017) of the Commercial Platform’s net income. These businesses showed strong organic growth, with investment in increasing sales forces (from c 1,000 reps in 2008 to c 2,400 now) and geographic expansion into other adjoining regions paying dividends. Manufacturing was also upgraded significantly, with the sizeable incentives given by local government for the sale of their existing production facilities (which, due to urban expansion, found themselves to be in now prime locations) re-invested in creating large, flexible, modern GMP facilities in more rural settings. These have been designed to ensure there is ample capacity to meet the forecast demand through the medium term. 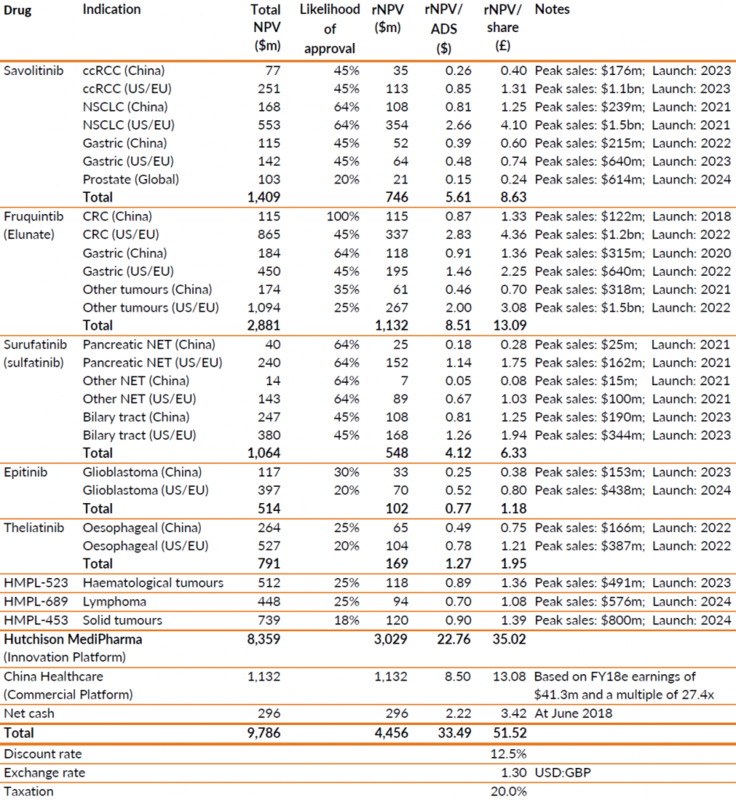 Exhibit 22 shows the operational reach of the Commercial Platform in China. Historically, the prospects for the China Healthcare operations underpinned Chi-Med’s investment case. With progress in the Innovation Platform there has been a tendency for the Commercial Platform’s contribution, and its future role, to be overlooked. Since 2005, the China operations/JVs have generated net income in excess of $500m. The strong, and consistent, cash flows have been a major source of funding for the Innovation Platform and will continue to be so until approval and launch of more clinical programmes. We expect the Commercial Platform will then return to the fore, forming the foundation for self-commercialisation of multiple products that are particularly suited for the Chinese market. The opportunities in China remain compelling. The demographics of an ageing population, greater urbanisation, rising educational standards, emergence of an increasingly wealthy middle class, coupled with lifestyles that are rife with high risk factors (nearly 60% of males are regular smokers) are well documented. These demand-side drivers are coupled with supportive government policies, at both the national and regional levels. The over-arching aims are to improve the services provided by the health care system, increase the number of insured citizens, to reduce corruption, to improve efficiencies, to reduce the overall cost of provision and, importantly, to improve safety. A central tenet is to provide access to health care for all by 2020 (Basic Medical Insurance) and much progress has been achieved in the past decade. The result has been an increase in the percentage of the population with healthcare cover, as well as growth in the expenditure per capita within that population. However, certain elements of the reforms have resulted in some areas suffering as price lists, such as the Basic Medical Catalogue, and formularies, for instance the National Essential Medicines List, caused pricing pressures for many smaller players with undifferentiated product ranges. Reforms of manufacturing standards have also seen the sub-optimal companies squeezed as they struggled to meet the regulations that were being enforced. The increased transparency of the “two invoice” system is also squeezing out multiple layers in the drug distribution structure, with a resultant improvement in efficiencies. The National Medical Products Administration (NMPA), formerly the China FDA, has reformed the registration process to accelerate drug approvals, particularly for novel compounds. Importantly, clinical data generated outside of China can now be used to support Chinese studies in product applications. The National Drug Reimbursement List (NDRL) was reviewed in 2017 and saw the inclusion of 36 innovative, high cost drugs. A further 17 oncology drugs were added to the list in the 2018 review. The policy is to reward innovation but increase price competition on patent-expired products. The National Development and Reform Commission (NDRC) is set to be replaced by the Medical Reimbursement Agency (MRA), which will be responsible for drug price regulation, reimbursement policy making, and over-seeing the centralised procurement of certain groups of medicines. Proposals introduced in late-2017 see a more robust intellectual property framework, with stronger patent protection, regulatory clinical data exclusivity, and restoration of patent life for regulatory delays. From the Chi-Med perspective, the current business units are well placed to continue to thrive. The OTC products are well-known brands that benefit from high consumer recognition. The prescription portfolio, especially within TCM, is well represented on the Essential Medicines List and hospital formularies with little pricing pressure expected even over the longer term. The key products have exclusivity protection, either as part of “National Treasure” status (Confidential State Secret Technology) or as patents (SHPL’s main product, She Xiang Bao Xin, with H118 sales of $130m, is protected through to 2029). The “softer” elements are also important in China: the businesses have proven expertise in tendering, price negotiations, and gaining market access; and managements have sound and long-standing relationships with governments (local and national) and regulators. Over 2019-2021, Chi-Med’s priorities for its Commercial Platform include a continued focus on cash generation and organic growth, particularly from the proprietary prescription drug products. High single-digit percentage growth in product sales is targeted. Management will also continue to strategically evaluate M&A opportunities, seeking to expand the scope and scale of JVs, while also exploring the potential for divestment of certain non-strategic assets. Another priority involves expanding the synergies with the China Oncology organisation. Looking further ahead, we believe Chi-Med is particularly suited to the evolving marketplace. China has a huge problem in diagnosing and treating cancer. The incidence of cancer in China is high, with around 4.3m invasive cancer cases diagnosed annually. The five most commonly diagnosed cancers among men are lung, stomach, oesophagus, liver, and colorectal, which collectively account for about two‐thirds of all cases. The corresponding cancers among women are breast, lung, stomach, colorectal, and oesophagus, which account for nearly 60% of all cases. There are significant differences in the incidence rates compared to Western geographies, with stomach, liver, and oesophageal notably higher (interestingly, prostate cancer is much lower). The absolute incidence of lung cancers is also higher, due mainly to the number of active smokers. Despite efforts to improve access, the newer treatment options that have become standard-of-care in the West have tended to lag behind, due both to lower rates of clinical adoption and delays in approval (see Exhibits 23 and 24). These factors are changing, with numerous initiatives to address these known barriers. However, the historic delays in getting cutting edge treatments to patients means that the originator medicines have not established a dominant position in their segments. The inevitable, if subtle, bias towards a Chinese product means that a new domestic entrant can achieve a sizeable share within a short timeframe. This is particularly noticeable within the oncology space, where even a relatively little differentiated product, such as Betta Pharmaceuticals’ Conmana (icotinib), can achieve sizeable sales and market share. The value of being a “national champion” should not be under-estimated; with notable examples in multiple fields where a “domestic” player can out-perform the largest of global leaders. Chi-Med has a broad range of oncology TKIs that are well suited to treat the cancer types that are prevalent in China. Their high specificity means that off-target toxicities are reduced and so facilitating their use in combination regimen. Although it is too early to be definitive, continuing progress within the Innovation Platform should result in an attractive portfolio of oncology products for the Commercial Platform to market within China. In summary, the Commercial Platform has grown strongly over the past decades and has provided the financial underpinning for the Innovation Platform’s success. In the process it has become a recognised and respected player in both the OTC and prescription markets. Over the medium term, this infrastructure will be expanded to market the oncology products that are expected to flow from the Innovation Platform. Exhibit 25 shows the platform’s current status. As a fully integrated biopharmaceutical company, Chi-Med is subject to the typical risks associated with drug development and commercialisation. These include failure or delay in clinical development or the regulatory process, patent litigation, partnering, financing, and commercial risks such as competition, as well as pricing and reimbursement decisions. More specifically, the major near-term risks relate to the outcome of clinical trials and regulatory decisions for the key late-stage assets, savolitinib and fruquintinib. Overall, the breadth of Chi-Med’s TKI pipeline helps de-risk the company technically; it covers a variety of mechanisms of action with potential across a range of cancer indications. Its best-in-class programmes have been de-risked as the MOA is known, while first-in-class TKIs – with an expected clean safety profile and potential for use in combination settings – should prove to be commercially attractive (both to potential partners and payors). Chi-Med’s sustained commercial success in China has been due to the established infrastructure, which has significant national and local expertise. Plans to self-market the products emerging from the development pipeline will require expansion of the Commercial Platform. Increased competition for quality staff from existing domestic and multi-national players, as well as emerging Chinese companies, may hinder the scale-up required. The two most advanced programmes, savolitinib and fruquintinib, have been partnered with large multi-nationals (AstraZeneca and Eli Lilly respectively). Whilst the relationships have worked well to date, there is a risk that their development and commercial priorities may alter to the detriment of Chi-Med’s best interests. Political and economic concerns are inevitable with such a large and influential market as China, and as Chi-Med’s operations become increasingly global. Regulatory risks are more relevant as Chi-Med’s activities are all subject to extensive oversight from a variety of international, national, and regional bodies. In this context, the strong domestic management helps mitigate many of these sensitivities with a more nuanced approach, supplemented by ex-China expertise in the growing US operations. CK Hutchison, the largest single shareholder (c 60% stake), provides substantial support. Its expertise and presence (commercial, political, and corporate governance) materially reduces the risks associated with any direct investment in China. However, it does raise concerns about being a minority shareholder. While understandable, we believe the reputational damage incurred by any adverse move would preclude any unfair treatment. 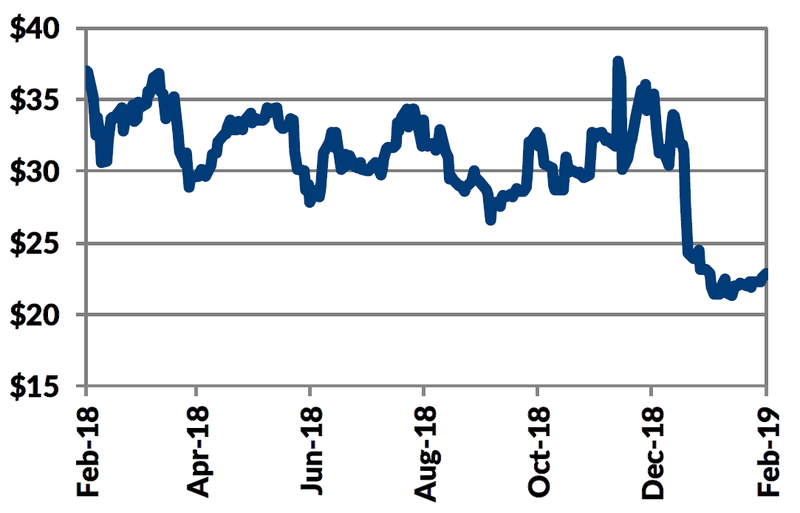 More importantly, the CK Hutchison holding (coupled with other large long-term holders) is perceived by some as reducing the genuine free float and constraining liquidity. Volumes traded, and consequent difficulties in amassing a worthwhile holding, have long been cited as a discouragement for active investment from large generalist funds. However, such concerns fail to reflect the fact that Chi-Med has made significant strides in its corporate ambitions, which is increasingly seen in its market position and resulting improved liquidity (3-month average trading volume is 500k+). During 2018, Chi-Med became a constituent of the NASDAQ Biotech Index and MSCI China Index. We believe valuing Chi-Med is best done using a sum-of-the-parts methodology, with an earnings-based multiple for the Commercial Platform and an rNPV model for the Innovation Platform. Our comprehensive model (see Exhibit 26 overleaf) results in a valuation of £3,428m, or $4,456m, equivalent to £51.52 per share or $33.49 per ADS, for Hutchison China MediTech. The Innovation Platform contributes £2,330m, or $3,029m, with the Commercial Platform adding £870m, or $1,131m. The Innovation Platform consists of the Hutchison MediPharma drug discovery and development operations. This is a classic emerging biopharmaceutical play and should be valued using a DCF approach. We have calculated a rNPV (risk-adjusted net present value) for each of the clinical programmes, with suitable adjustments for success probabilities that consider the nature of the compound (eg is the mode of action novel or proven) and the proposed indication (eg degree of expected competition and likely rate of adoption). Intuitively it follows that the later stage projects have a higher rNPV, with the step-change occurring on completion of Phase II proof-of-concept trials. These individual programmes (which explore the lead indications) are summed and netted off against the costs of running the organisation and net cash/debt. Exhibit 26 above presents the relative contributions of each programme to our valuation. The detailed components of our Innovation Platform rNPV valuation are shown in Exhibit 27 overleaf. 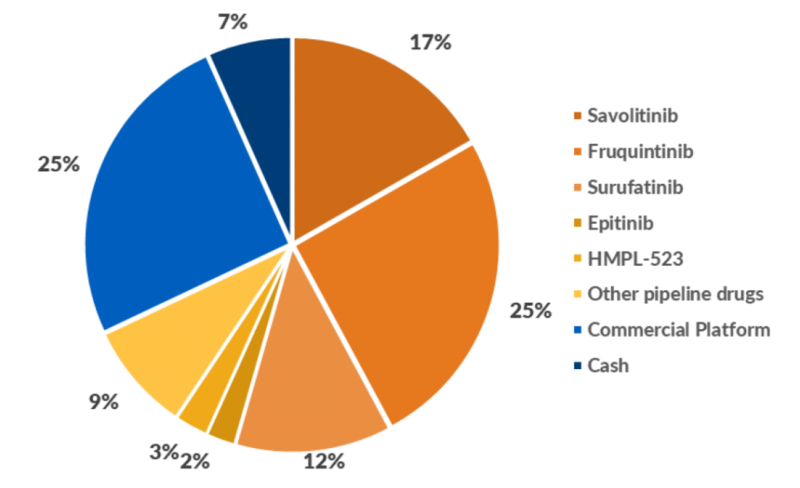 Looking at the elements of our rNPV valuation in greater detail: fruquintinib is the largest component of the valuation, amounting to £13.09/share (£871m) or $8.51/ADS ($1,132m), with savolitinib being the next most valuable clinical asset at £8.63/share (£574m) or $5.61/ADS ($746m). Source: Trinity Delta Note: pRCC = papillary renal cell carcinoma; ccRCC = clear cell renal cell carcinoma; NSCLC = non-small cell lung cancer; CRC = colorectal cancer; NET = neuroendocrine tumours. where 100% of sales are lost within the year. Such assumptions may appear harsh, but we believe they are reflective of the marketplace for even truly innovative treatments. Royalty rates, on partnered programmes, are based on publicly available information and where no guidance is available we have used rates of between 15% and 20%. The Commercial Platform, consisting of the wholly-owned and JV operations in China, is generating material revenues and profits so examining earnings-based metrics is appropriate. It is worth noting that since the sales of the JVs are not consolidated, any revenue-based ratios will significantly undervalue these operations. 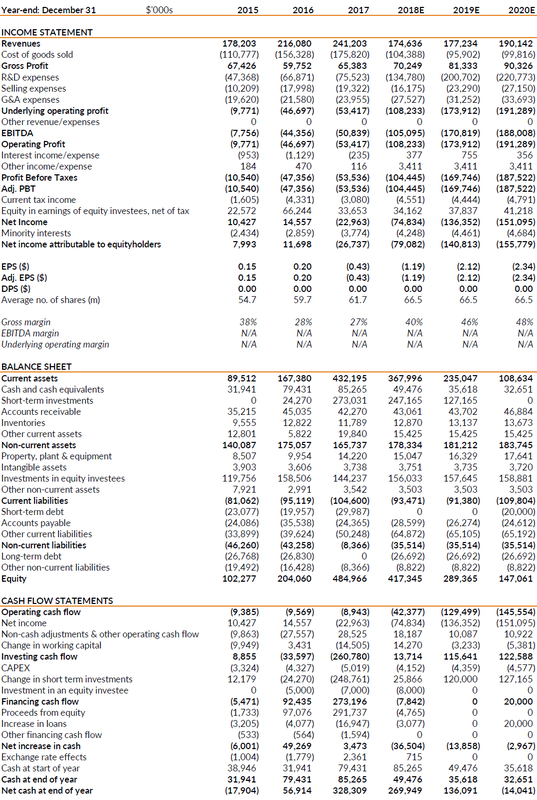 We have applied revenue-based multiples to the wholly-owned assets and the JV entities as a reality check and found that they do support the earnings-based results. We have examined 43 Chinese listed pharmaceutical companies, with market capitalisations ranging from c $300m to c $40bn. All are revenue generating (with sales arising within China) and most are profitable (loss-making companies are excluded). We ignore companies where the multiples appeared to be distorted by non-recurring events or were outliers. We also exclude companies where the multiples appeared too high, suggesting an element of speculation within the share prices rather than simply reflecting the operating businesses. Although there is an element of subjectivity in this peer group selection, the logic driving the decisions is to maintain our conservative approach throughout. The end-result (Exhibit 27) is a valuation of $1,131m for the Commercial Platform, which equates to a multiple of 27.4x on FY18e earnings of $41.3m. The range of valuations from the various scenarios examined is quite tight, spanning from $1,056m to $1,364m. It worth emphasising that we employ conservative assumptions throughout our modelling; hence it should be noted that any number of incremental improvements on our base case scenarios (notably with the Innovation Platform) could result in sizeable uplifts in our valuation. We also err on the side of caution regarding a couple of areas where we expect transparency to increase in the near-term. For example, we do not currently value savolitinib in PRCC; clarity on the registration strategy would prompt inclusion of this indication in our valuation. Equally, for fruquintinib, we apply the 2013 deal royalty rate (15-20%) ahead of approval of the first LCI in China, and also aggregate NSCLC and LCIs in ‘other tumours’ pending more information on the next steps for clinical development. Equally importantly, the visibility for the outlook of the late-stage clinical programmes is increasing, with a rich news flow over the coming years. This suggests that there is significant upside potential, with multiple catalysts expected in the next 6 to 24 months. We intend to review the model regularly to reflect the progress that should be achieved. The overall revenues were $241.2m in FY17, up 11.6% from $216.1m, which was made up of collaboration sales (service fees and milestones) and consolidated revenues from the Commercial Platform. The FY17 operating loss was $53.4m, compared to $46.7m in the previous year reflecting an increase in R&D spending to $88m. Chi-Med also reported a loss of $26.7m in FY17 at the net income level, after accounting for the non-consolidated earnings from its JVs; in FY16 the net income was a profit of $11.7m. The reported accounts tend to downplay the scale of the Commercial Platform. In 2017 total Commercial Platform (China Healthcare) revenues were $677.2m, up 8%, but because of the manner in which the JVs are reported, only $205.2m was reported as revenue under US GAAP. 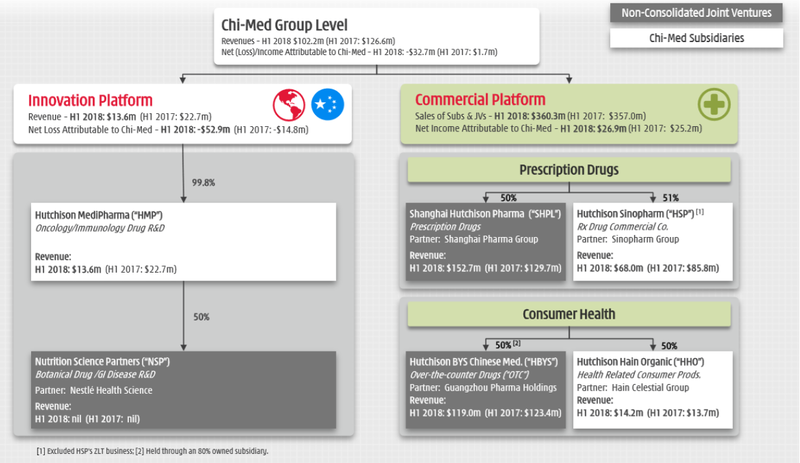 For context, the Shanghai Hutchison Pharmaceuticals prescription JV posted 2017 sales of $244.6m and net income of $55.6m, and the Hutchison Baiyunshan consumer health JV posted 2017 sales of $227.4m and net income of $20.8m. The contributions from these operations, $38.2m in 2017, are included within the Chi-Med accounts as net income (after tax) from equity investments. Profits from these operations are used to support investment in the Innovation Platform (Hutchison MediPharma). Reported revenues in FY18 are forecast to fall to $174.6m. This is due to legal changes in China (the “two invoice” accounting/booking system) that alter the previous standard practice, which affects how Hutchison Whampoa Sinopharma reports its revenues. Sales from this division are estimated to drop by 42% to $97.0m as a result, but its profitability is unaffected. The level of investment in R&D in the Innovation Platform has grown at a CAGR of 35% between FY13 and FY17 to fund the broad development programme with 36 clinical trials in process. In FY17, the R&D expense was $75.5m (up from $66.9m in FY16), and this spending is expected to continue to rise significantly to support the growing number of pivotal studies and increased global investment. We estimate that Chi-Med will be investing $134.8m and $200.7m in R&D in FY18 and FY19, respectively. Chi-Med is well-capitalised and had cash resources of $416.9m at June 2018; which consisted of cash, cash equivalents, and short-term investments of $322.5m and unutilised bank facilities of $94.4m. Additionally, the non-consolidated JVs (notably Shanghai Hutchison Pharmaceuticals, Hutchison Baiyunshan, and Nutrition Science Partners) held a further $62.5m in available cash resources. The company is confident this should support the increased spending in R&D through to at least 2020. We believe, given the clinical opportunities, that it would be judicious to issue some additional debt (c $20m in FY20 in our modelling), in the absence of an additional capital raise. Debt financing for Chi-Med could be an attractive option for the company, given the strength of its commercial operations, broad pipeline and backing (implicit and explicit) from CK Hutchison. Simon To Chairman Director since 2000 and Chairman since 2006. Managing Director and founder of Hutchison Whampoa (China) Ltd, with over 37 years service. He built the business from a small trading company to a multi-billion dollar investment group with diverse interests, negotiating major transactions with various multinationals (including Proctor & Gamble, Lockheed, Pirellu, Beiersdorf, United Airlines and British Airways). Currently a director of Gama Aviation Plc. He holds a BSc (Hons) Mechanical Engineering (Imperial College London) and an MBA (Stanford). Christian Hogg CEO Executive director and CEO of Hutchison China MediTech since 2006, having joined Hutchison Whampoa (China) in 2000. He led the creation, implementation and management of Hutchison China MediTech’s strategy, business and listing; as well as the acquitions and operatonal integration of assets that led to the formation of the China JVs. Previously 10 years at Procter & Gamble in various finance and management roles, including managing the detergent business in China and the global bleach business. He holds a BEng Civil Engineering (University of Edinburgh) and an MBA (University of Tennessee). Johnny Cheng CFO CFO since 2008 and Executive Director since 2011. Previously VP, Finance of Bristol Myers Squibb in China and a director of Sino-American Shanghai Squibb Pharmaceuticals and BMS (China) Investment Co (2006-2008). He also spent eight years with Nestle China in various finance and control functions, and was an auditor at Price Waterhouse (Australia) and KPMG (Beijing). He holds a Bachelor of Economics, Accounting Major (University of Adelaide) and is a member of the Institute of Chartered Accountants in Australia. Dr Weiguo Su CSO Joined in 2005; Executive Vice President and CSO since 2012; and Executive Director since March 2017. He has responsibity for all R&D and R&D strategy, and created the Innovation Platform, leading all the small molecule pipeline discovery activities. Prior roles include 15 years with Pfizer’s US R&D department (most recently as Director of Medicinal Chemistry). He holds a BSc in Chemistry (Fudan University, Shanghai) and completed a PhD and Post-Doctoral Fellowship in Chemistry at Harvard University under Nobel Laureate, EJ Corey.